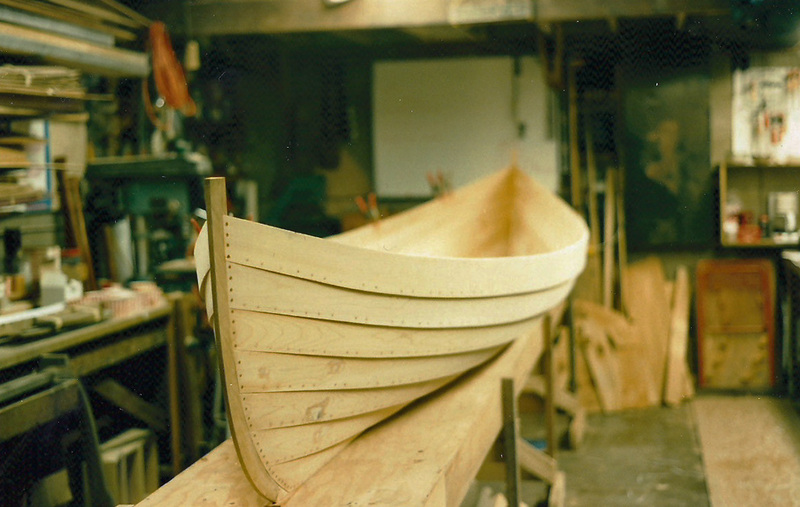 In 1996/7, I built a St. Lawrence Skiff at the shop of my friend Peter the Boatbuilder. 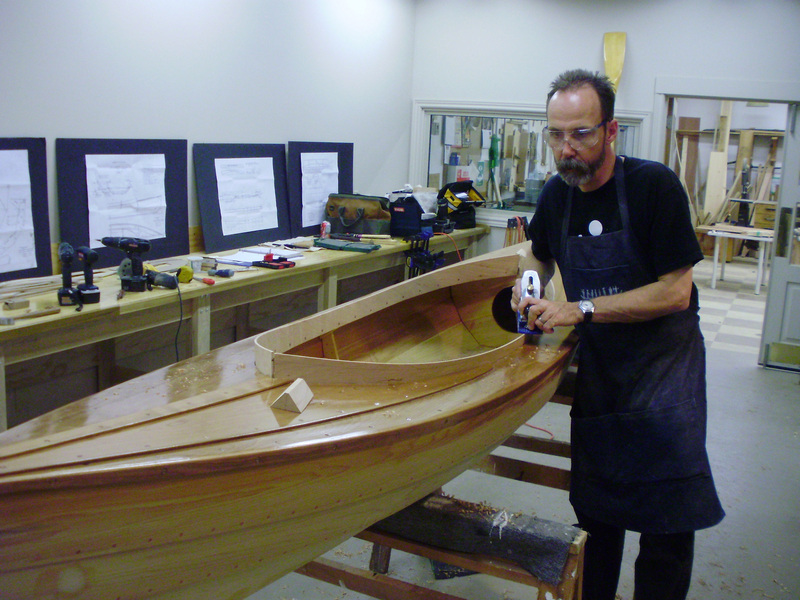 He was the boatman at the Argonaut Rowing Club in Toronto, and in exchange for looking after the club’s boats, he ran his boatbuilding shop out of the club. 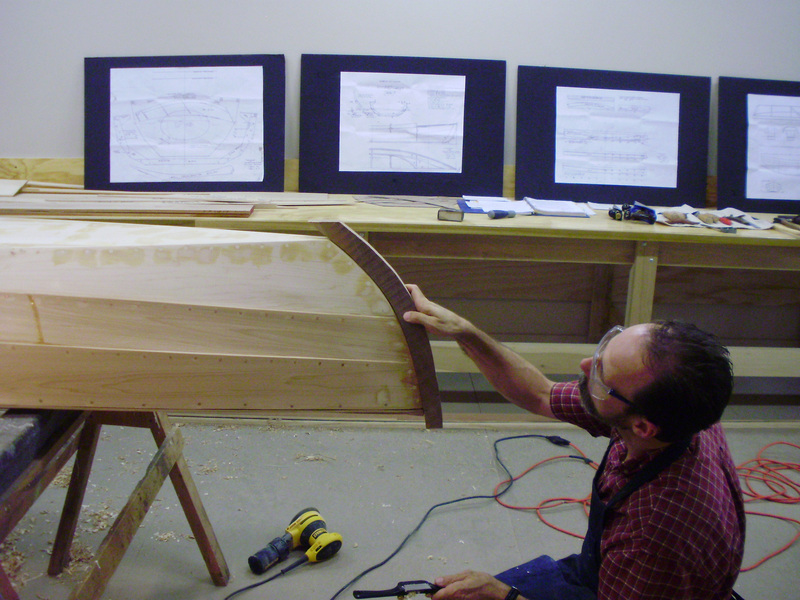 I shared the space with him while we built two traditional skiffs, one for me and one for him. 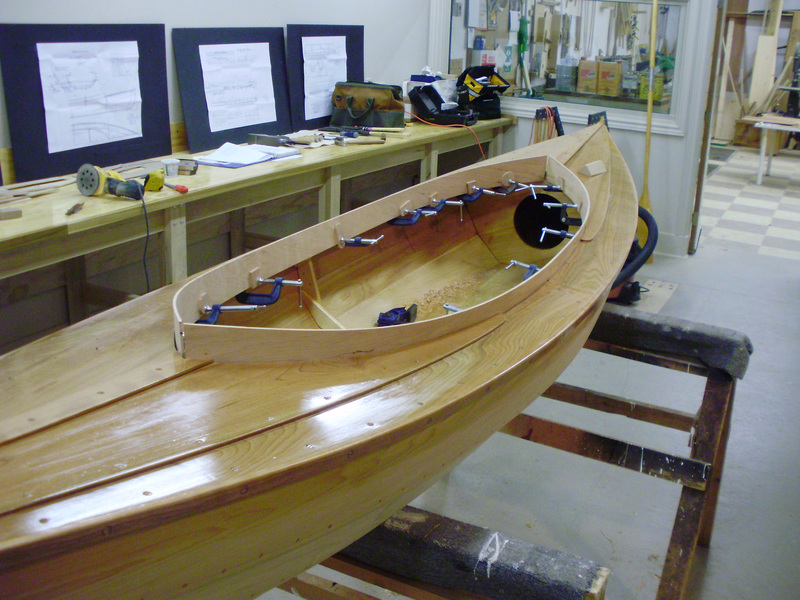 He’s still building boats, most recently with Youth Boatworks Canada, and just finished a Bantry Bay Gig for the Atlantic Challenge competition. 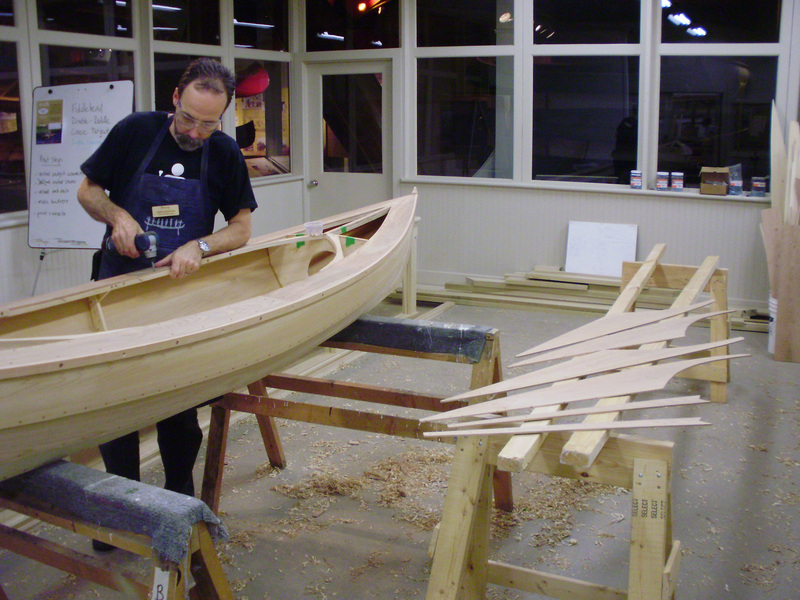 Here's Peter at work lofting the skiff. 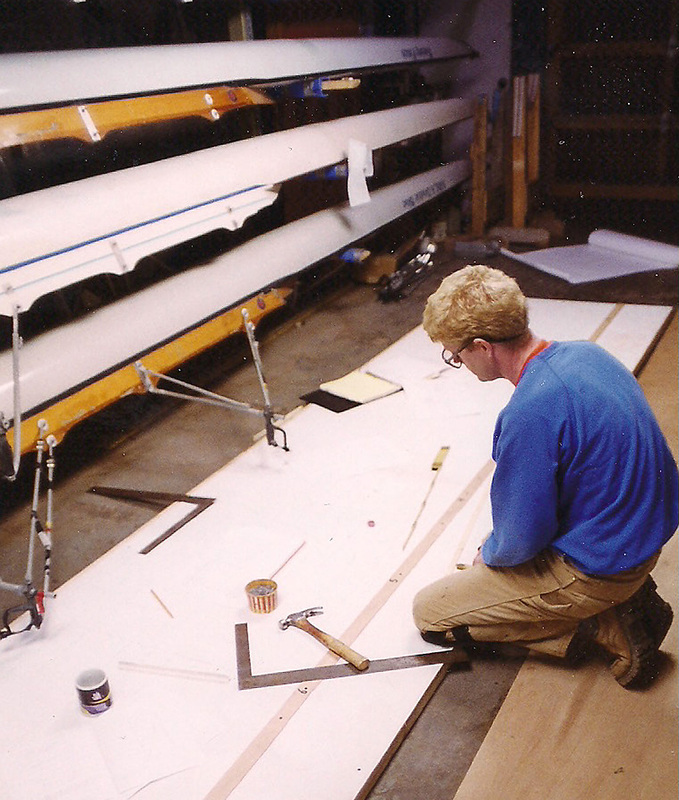 And here I am, laying out the keel line on the same lofting. I even got my wife involved. 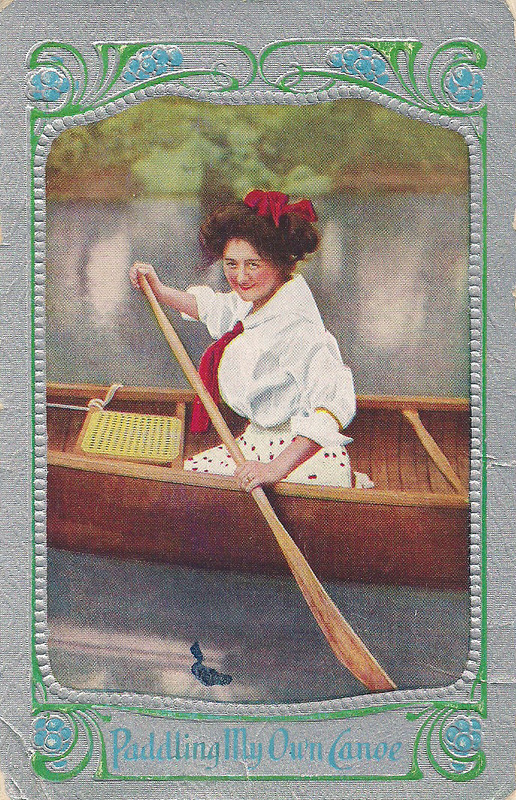 Here's Wendy bevelling a lap on our skiff, which we would eventually name for her mother, Isabel. 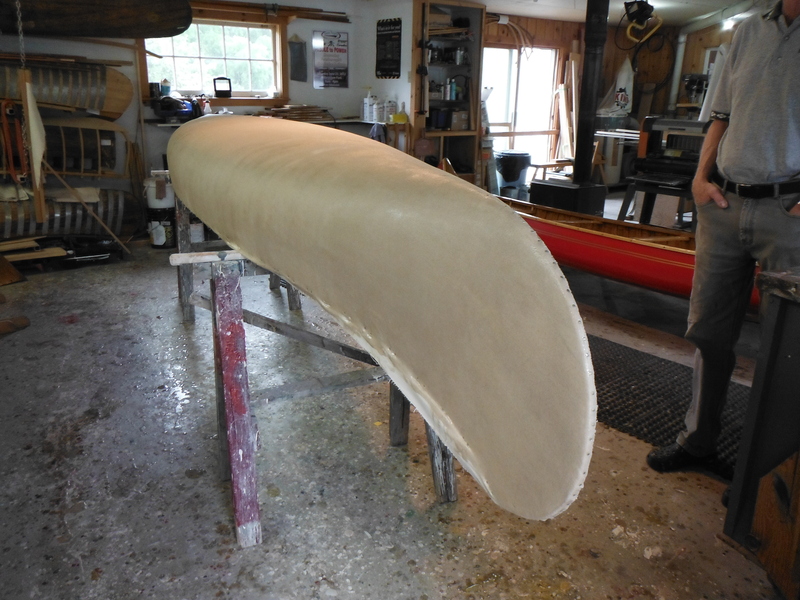 And here's the skiff planked up and off the moulds, ready for ribs. 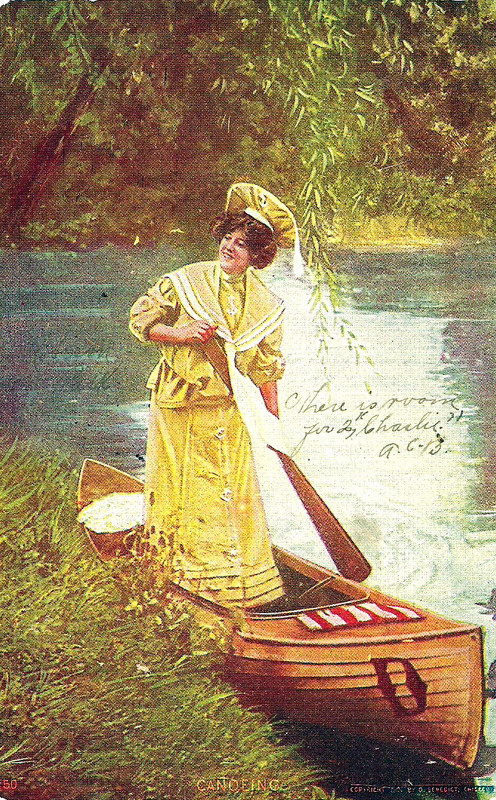 Lovely pictures, but what’s this got to do with antique rulers? Well, one day not long after this picture was taken, I came into the shop and there was a present waiting for me on the workbench from Peter. 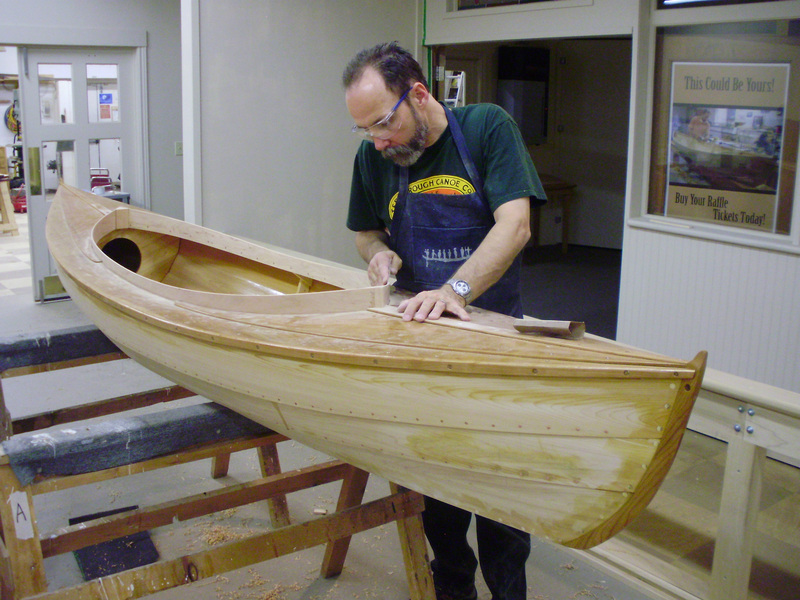 He studied traditional boatbuilding at the Northwest School of Wooden Boatbuilding in Port Townsend, WA, and it was probably there that he got introduced to traditional folding wooden rulers. 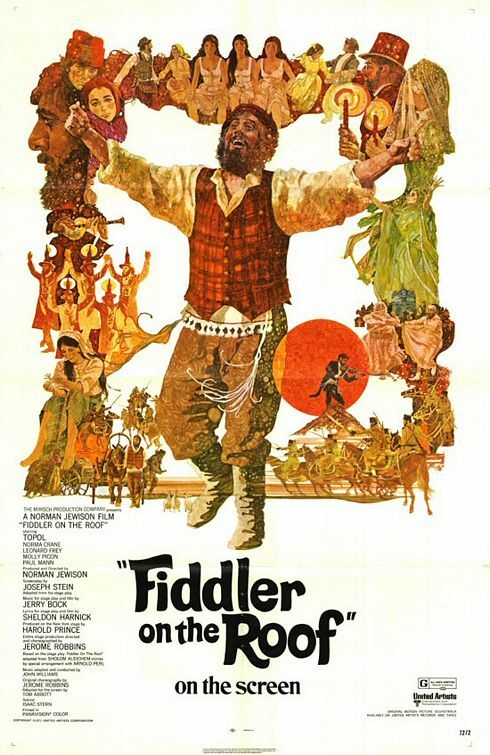 Sometimes these get called “Blindman’s Rules,” although strictly speaking, that name only refers to one particular kind with especially large numbers. 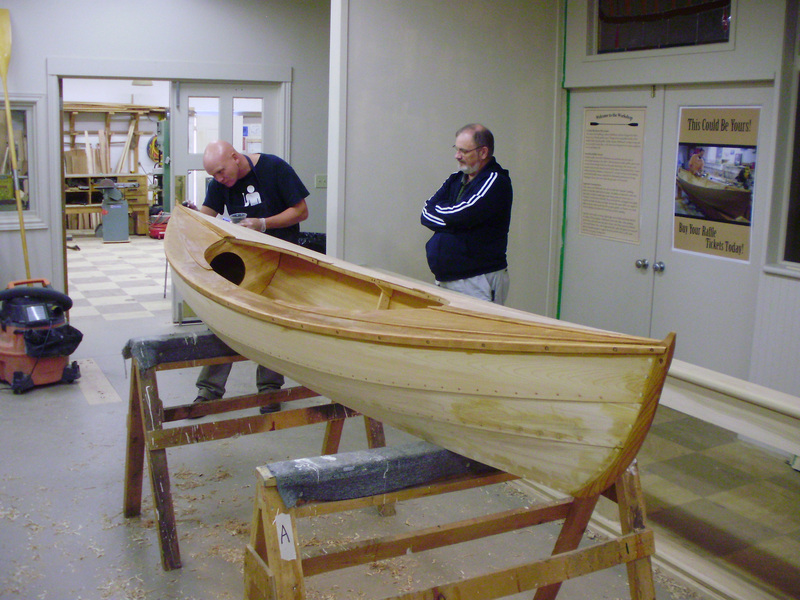 Peter had one that he used a lot on the skiff project, and I guess he had seen me admiring it while we worked. 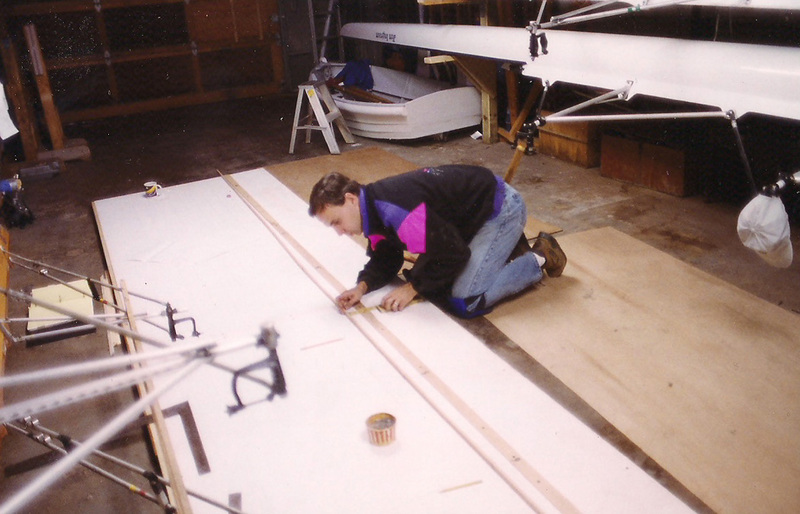 On the workbench that day was a package made from masking tape and a Country Style Doughnuts box (takes a lot of doughnuts to build a traditional wooden boat, so there were always plenty of boxes around the shop). 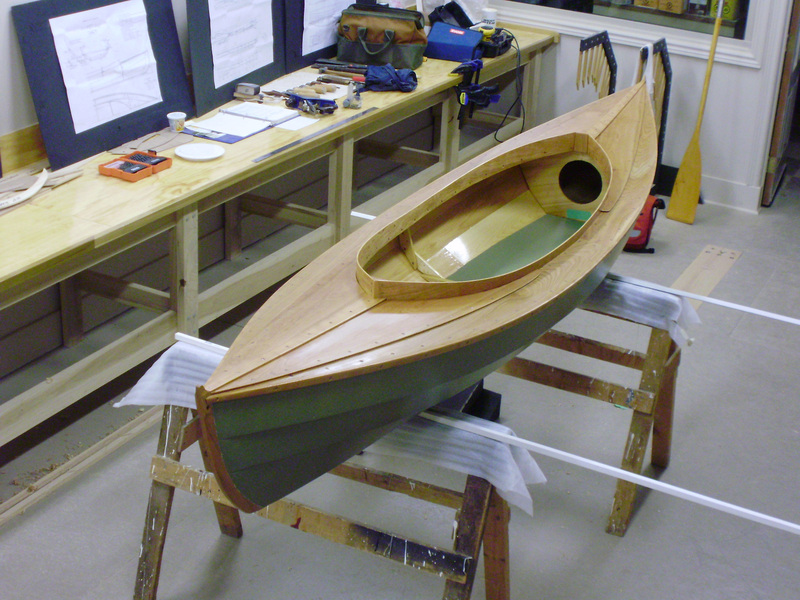 Inside was a folding wooden ruler of my own, my “graduation” present for having gotten my skiff planked up and off the moulds. 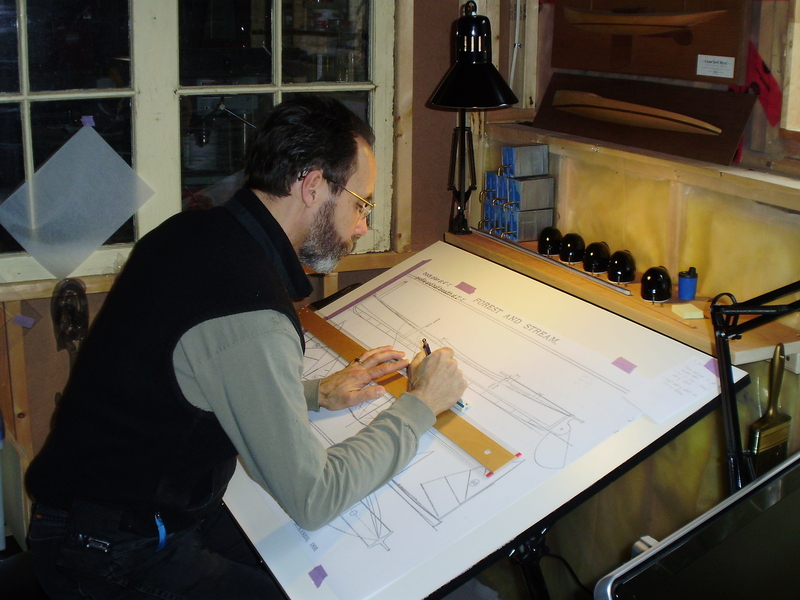 I still have the ruler, and I used it often while I was building the Fiddlehead this summer. 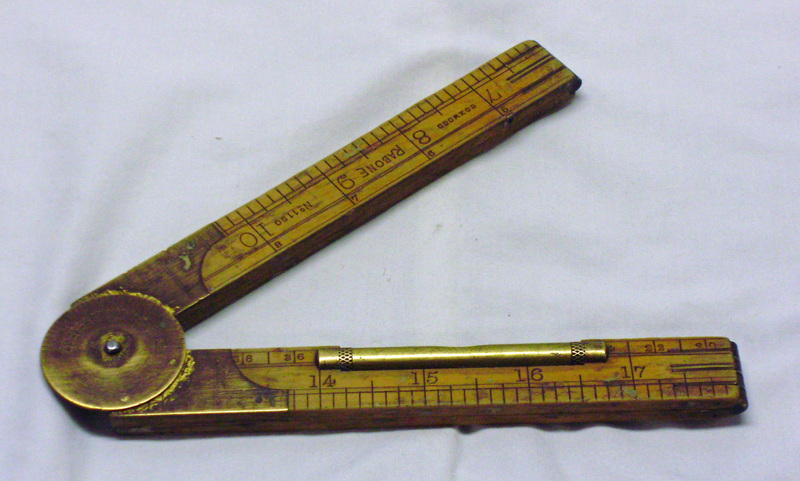 This is the ruler that started it all for me, a Stanley #61 boxwood two-foot, four-fold, square-joint ruler with middle plates, manufactured between 1855 and 1957. This particular one could be pre-1949. Even a quick glance through Alvin Sellen’s book encyclopedic book Stanley Folding Rules will give you a sense of the vast variety of these that were manufactured from the mid 19th to late 20th century by Stanley, Lufkin, Rabone and other tool companies. 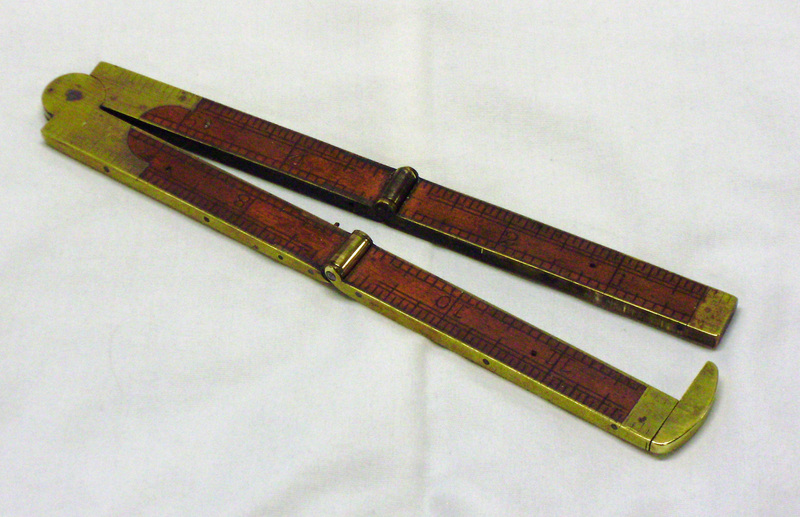 Carpenters, shipwrights, surveyors, blacksmiths, patternmakers and a host of other trades all had their own rulers with features suited to their particular work. In case you don’t already waste enough time on line, take a moment to hop on eBay and search for “folding rulers” to see how many of these are still around and just waiting for you to buy them. The wooden ones are nice, but in the mid 19th century they were also made from ivory and oxbone with German silver mounts, and those are really lovely (with a price to match). 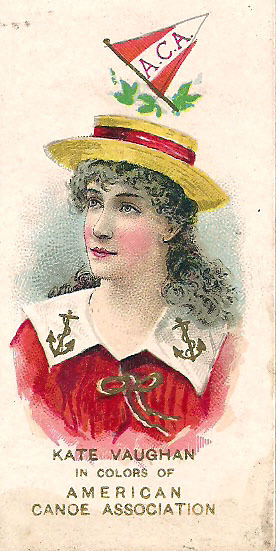 No question, then, that they make great collectibles, but are they really useful in the shop? For me, at least, the answer would be an enthusiastic “yes.” One of the things we’re blessed with in the 21st century is choice–just think of how many things there are to eat for breakfast in the average grocery store, for instance. It’s no different in the workshop. Need to cut something? If you have any kind of workshop at all, I bet there’s at least 6 different ways to accomplish the same purpose ready to hand (I took a moment to count my own stuff: compound mitre saw; tablesaw; bandsaw; 2 different sizes of Skilsaw; several japanese saws; several western hand saws). Obviously if I have to measure off a 6′ piece of stock I’m not going to use my four-fold, two-foot folding ruler three times in a row. 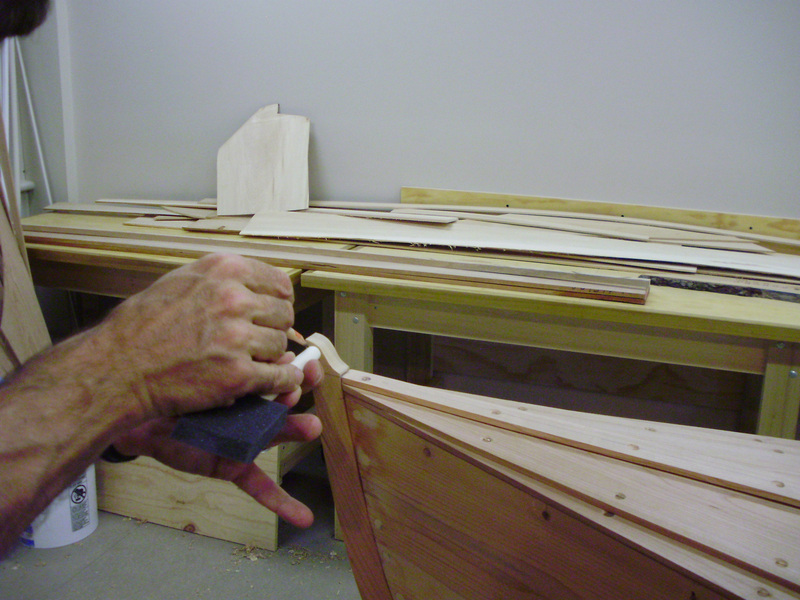 But for smaller measurements around a traditional boatbuilding project, these folding rulers work very well. As an added benefit, and here’s where the choice comes in, I find them just plain enjoyable to use (which I suppose is the same thing that someone else might say about their LED-equipped digital laser tape measure), and so use them I do. It’s a pleasure to have something in your hand that offers a connection to people who used to do what you’re doing now. Folding rulers also look very official sticking out of your back pocket or apron, and if you’re working in public, they’re great conversation starters. 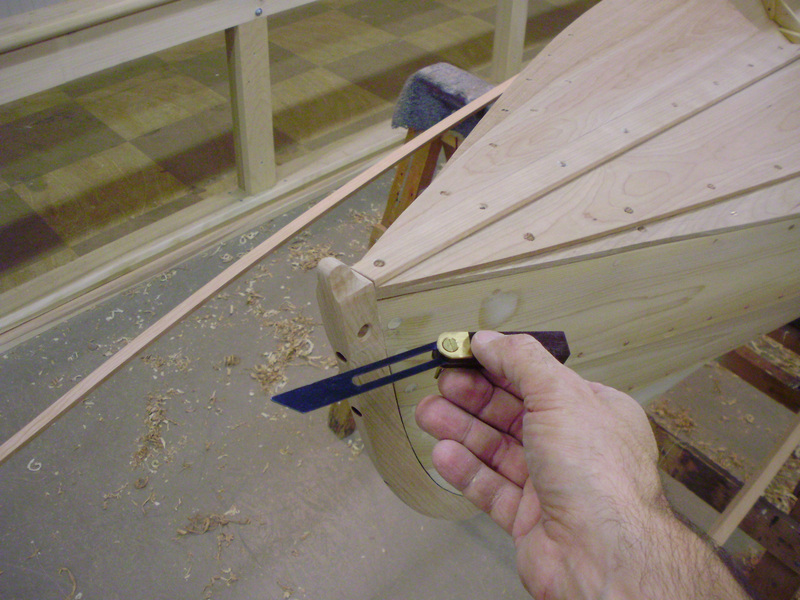 Here's my Stanley #61 in use, checking the progress of a lap bevel at the midships frame. Did I mention that these kinds of rulers are available on eBay? 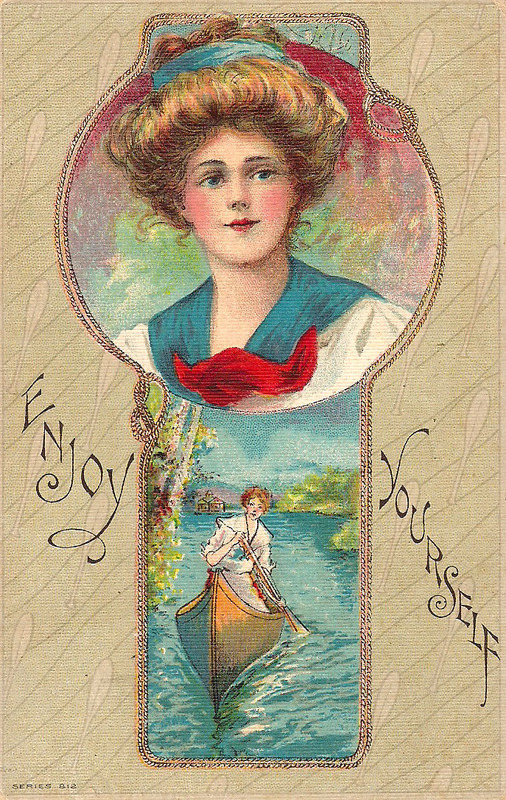 and from antique tool websites, antique tool shows, flea markets and garage sales? I still have and use the Stanley #61 that Peter gave me more than 15 years ago, but that hasn’t stopped me picking up a few more over the years. Here’s some favourites from the “measuring” drawer of my tool chest. These are all tools that I’ve collected to actually use, so I tend not to go for the pristine examples, or pay extra for an original box, but concentrate instead on pieces that are straight, solid and ready to work. 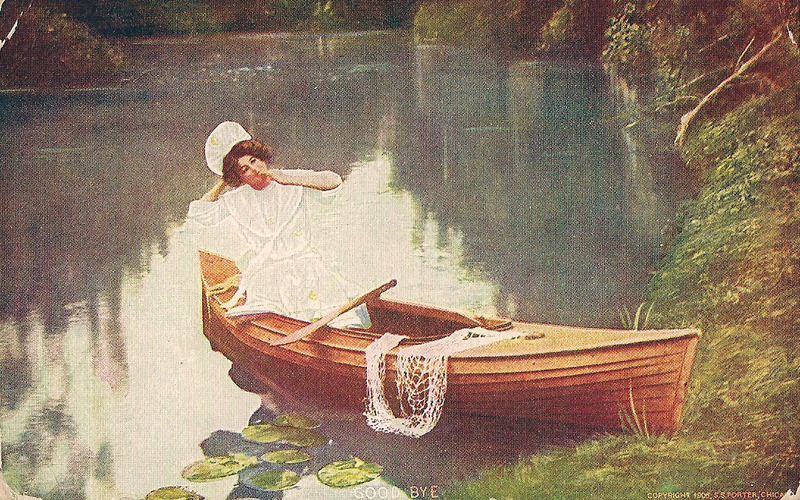 Here's a sentimental favourite. 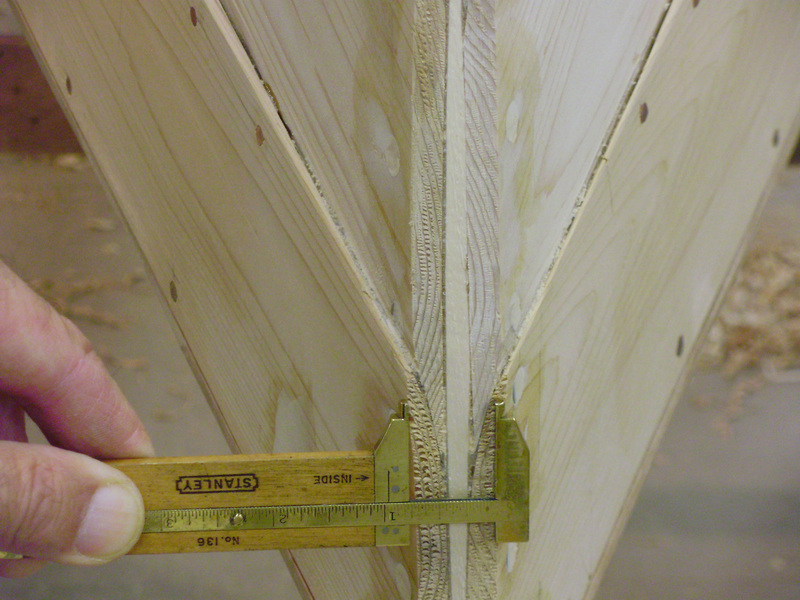 It's a four-fold, arch-joint caliper ruler with no visible maker's mark. The outside is very worn from years of travelling in someone's pocket, but the inside markings are still clear and usable. 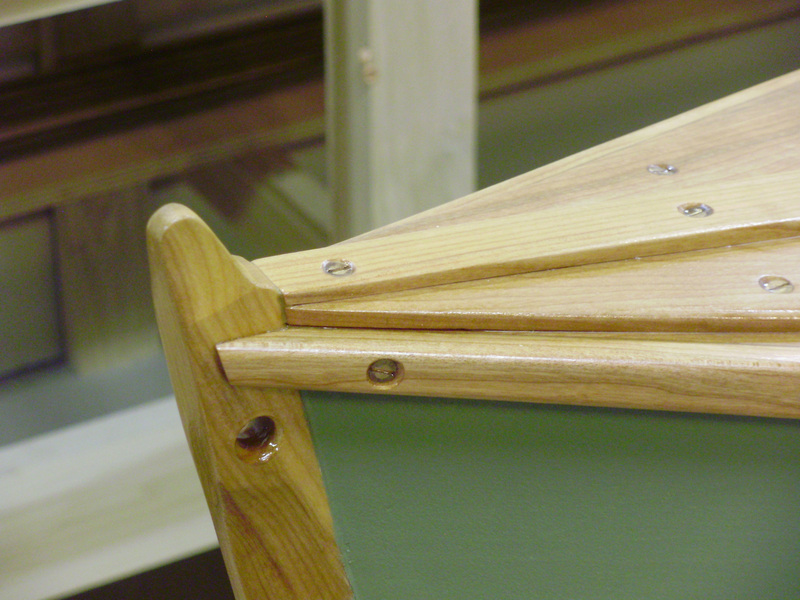 Two higher-end features are the arch-shaped joints at the hinge and the brass binding on the edges. I carry this in my pocket nearly every day just for the pleasure of having it around. Here's one I couldn't resist. It's a tiny Stanley 65 1/2, one-foot four-fold, brass bound with a square joint. 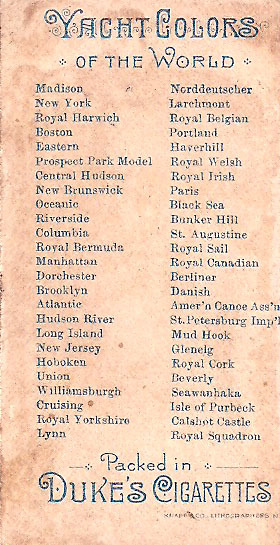 This type was manufactured from 1855 to 1934, and this particular one dates from some time after 1867. 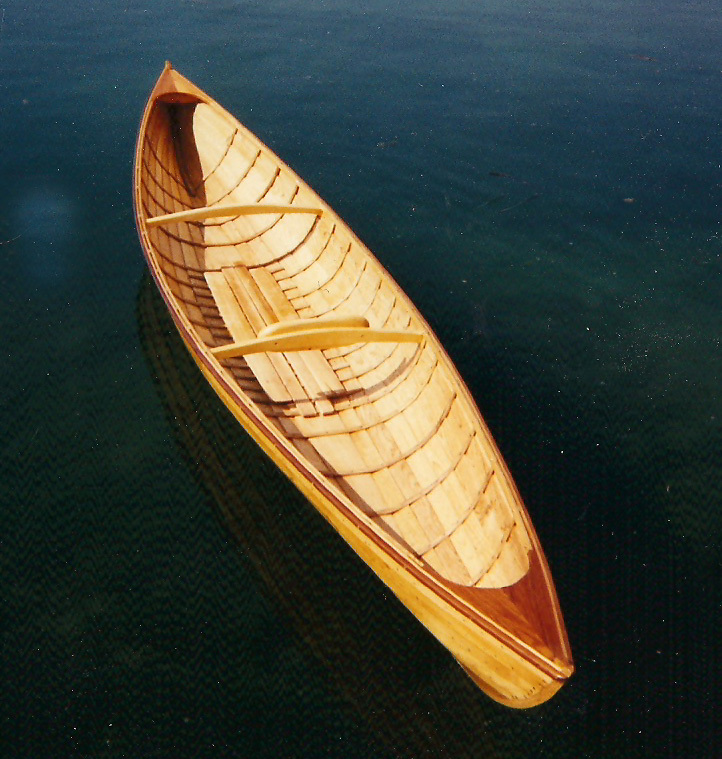 A Lufkin #42 boxwood Shipwright's Bevel. 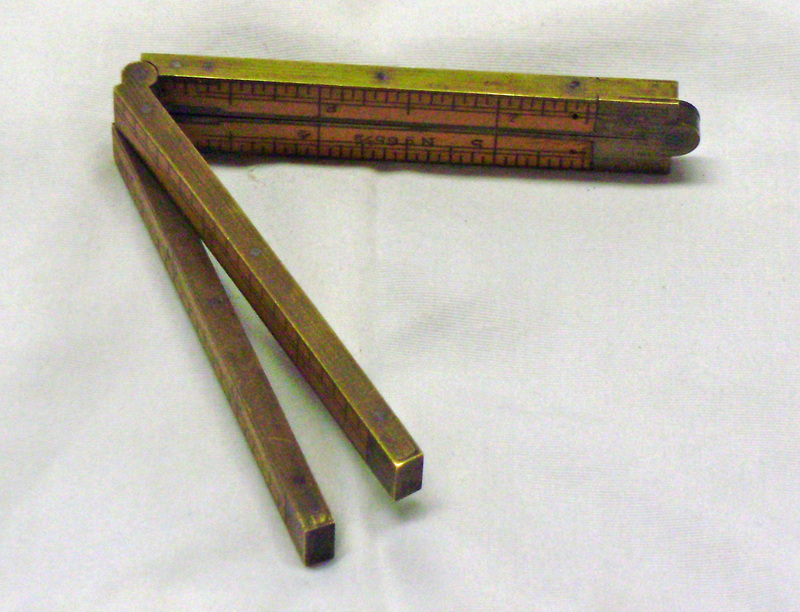 Competition was fierce in the ruler business, and Stanley offered an identical piece, also a #42, albeit with square ends on the brass bevel arms. Here's a kind of Swiss Army Knife folding ruler. This big, chuncky four-fold two-foot Rabone # 1190, possibly from the 1930s, has an arch-joint and engraved hinge marked with degrees for use as a bevel gauge, as well as a brass level. 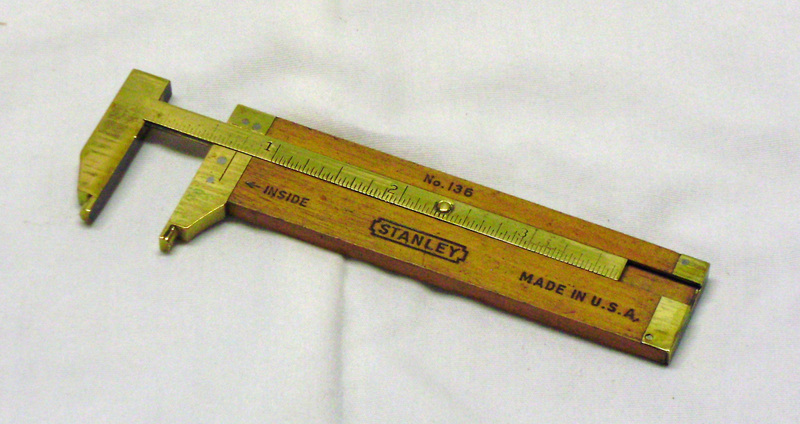 A Stanley #136, manufactured between 1932 and 1983, incorporating an inside/outside caliper as well as a ruler on the other side. 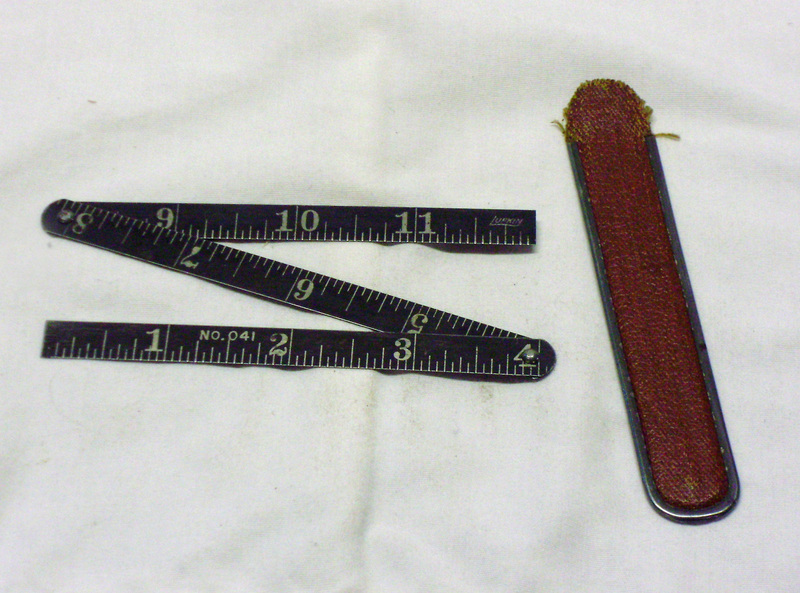 A Lufkin #41 3-fold, one-foot steel ruler with case. 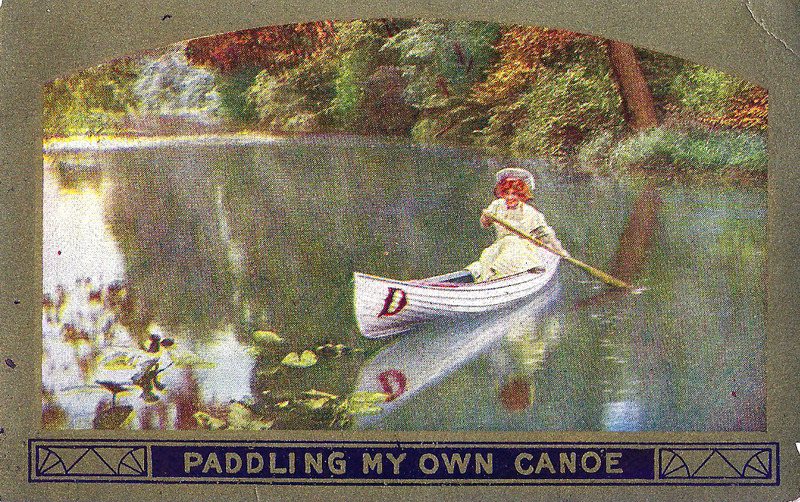 The leatherette case for this model was often embossed with a company's name so it could be used as a promotional item. Some great sources for rulers like this include eBay; Jim Bode Antique Tools; Vintage Tools and Bob Kaune Antique & Used Tools. 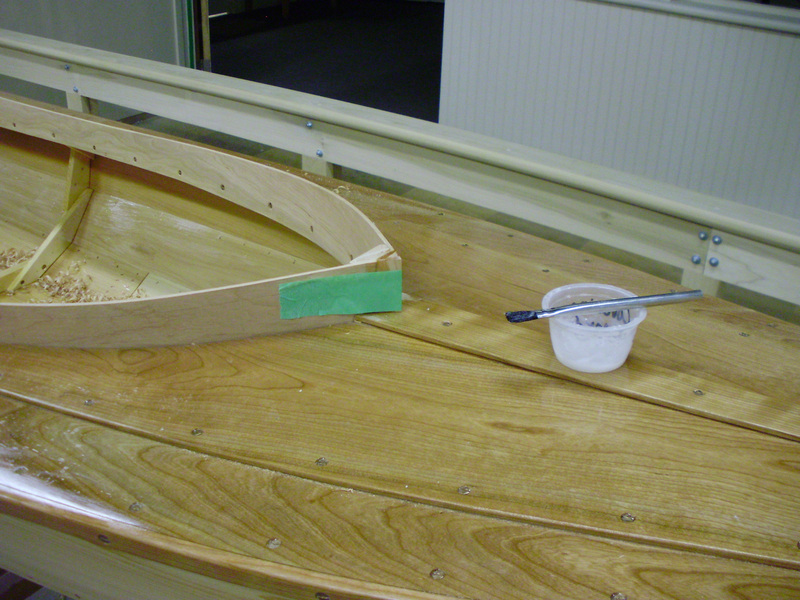 In this shot, the covering boards have been varnished on the underside and permanently screwed to the boat. 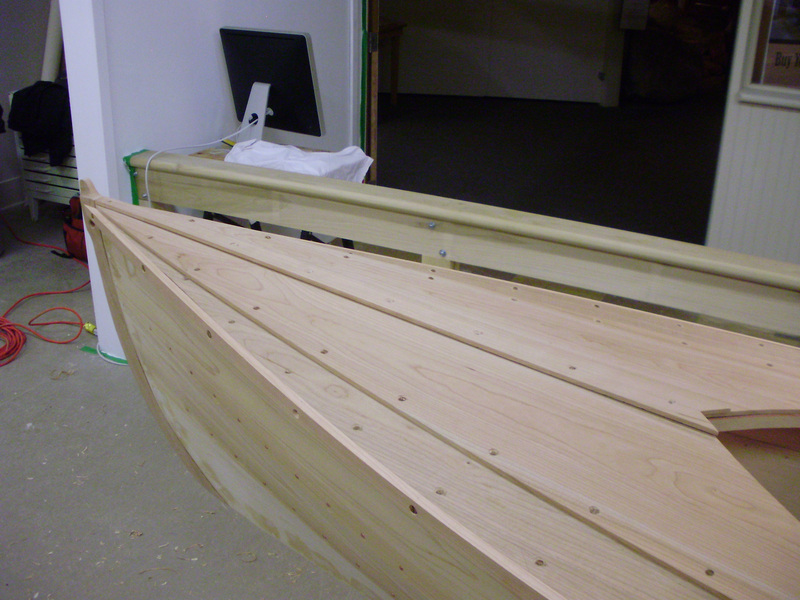 Where they cover the watertight compartment of each end, they’ve also been bedded in sealant. I’ve also taken the outer stem off, buttered it with bedding compound, re-attached it using all of the screws and epoxied a tapered wooden plug ineach screw hole which will be trimmed flush later. The inwales receive a coat of bedding compound on their backs before being screwed in place for good. With all of the decking and outwales permanently fastened, it’s time to start building up the finish. The first coatis usually thinned at least 50% to penetrate deeply and raise the grain. 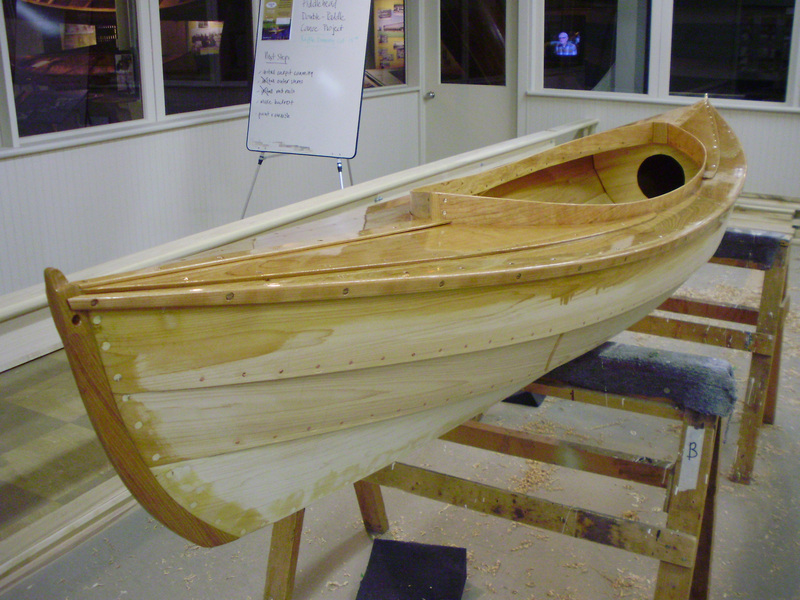 Even a thinned coat begins to bring out the nice warm look of the cherry. The next step is the cockpit coamings. 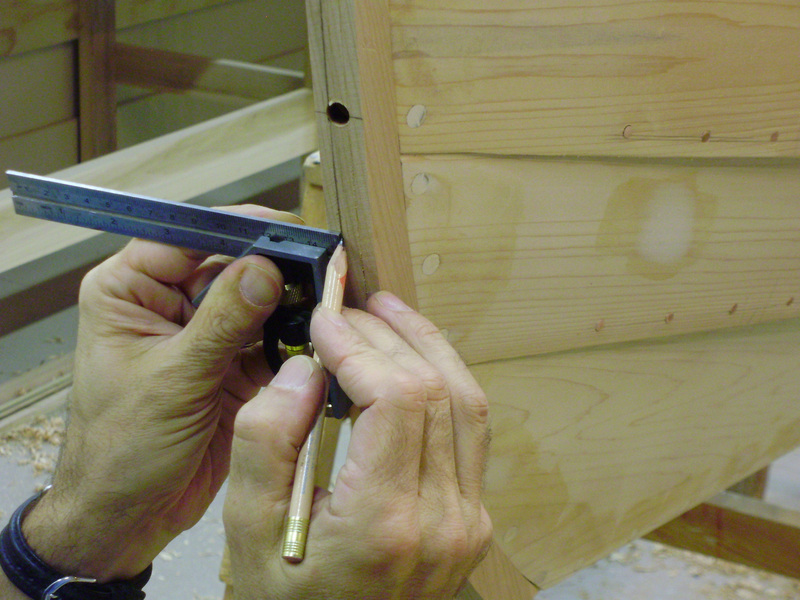 Because of the way Harry has designed the ends, they don’t have to fit together closely, but it still takes a couple of tries of clamping them in place dry to get the fit right. 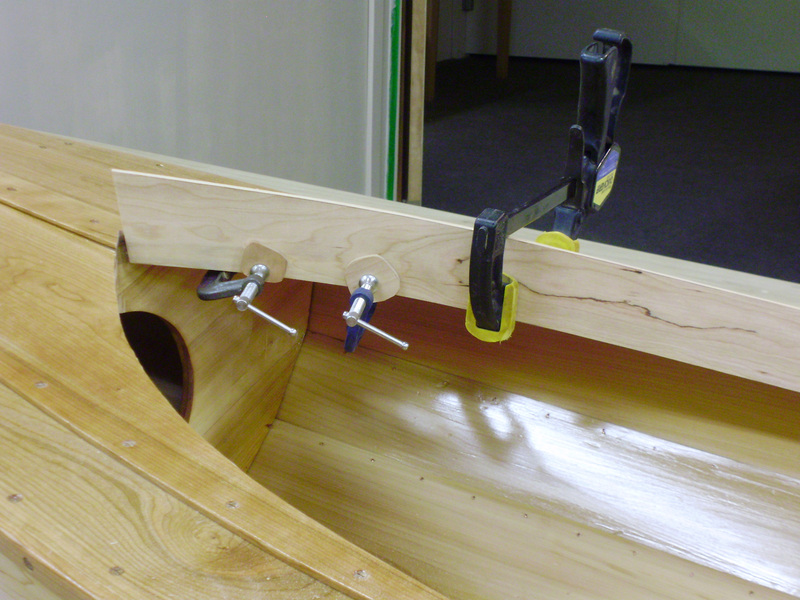 It’s a good idea to use clamping pads on the inside of the coaming to avoid marking it with the c-clamps. 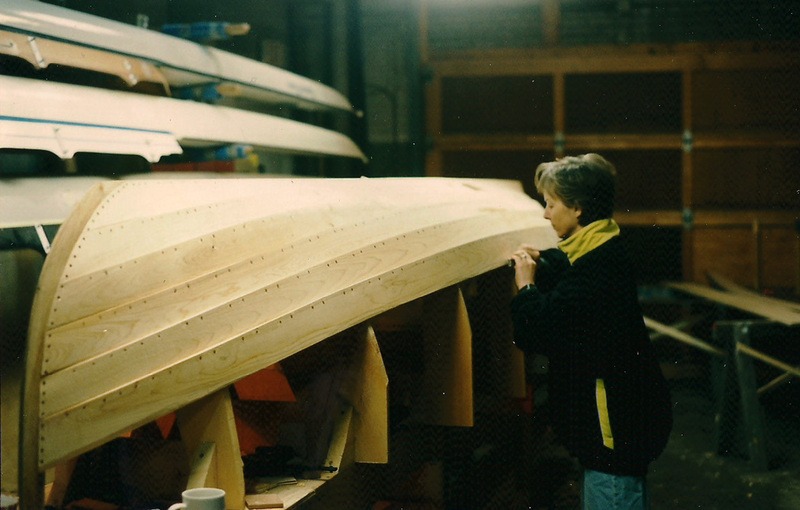 It’s also a good idea to not press too hard on the portion of the coaming that extends above the deck, or you might split it and have to get out another one in a hurry (this last sentence was written by the voice of experience!). 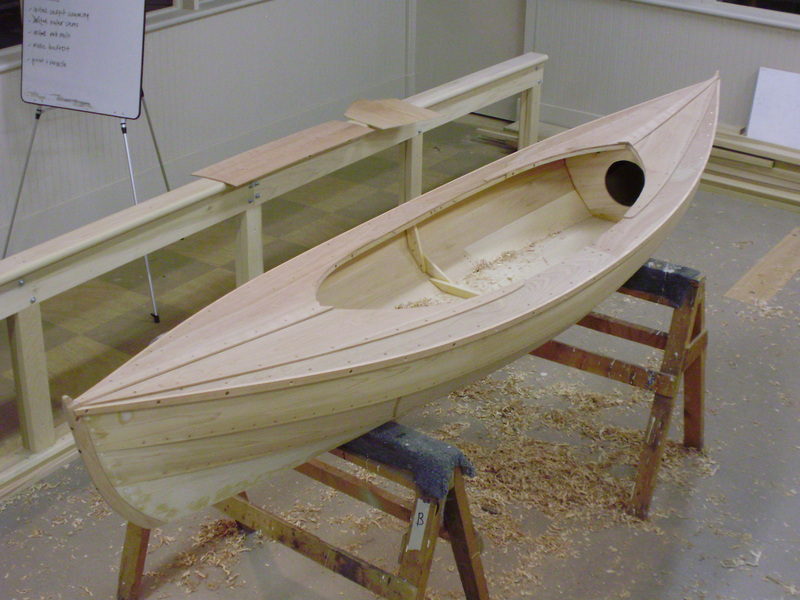 With both sides trimmed and clamped in place, the coaming can be fastened. 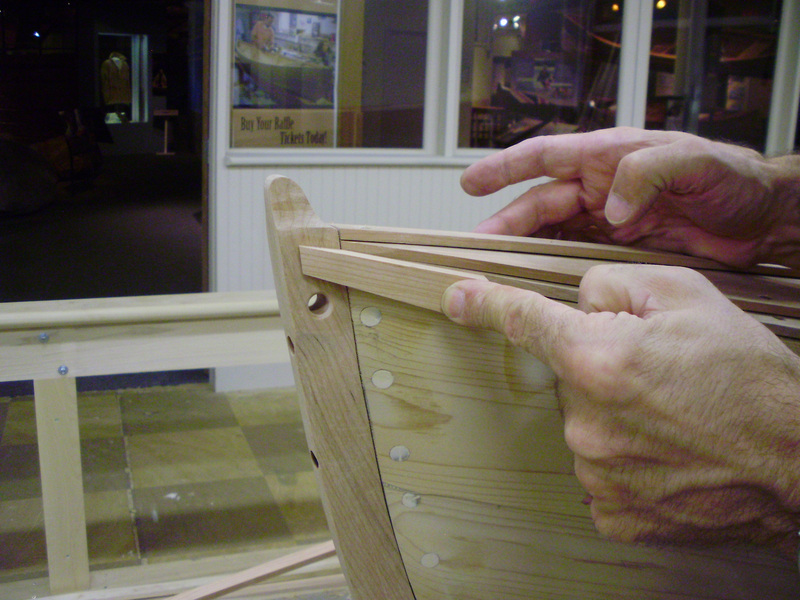 You’ll need to measure carefully from the bottom up to make sure the screws hit the carlin and not the deck. 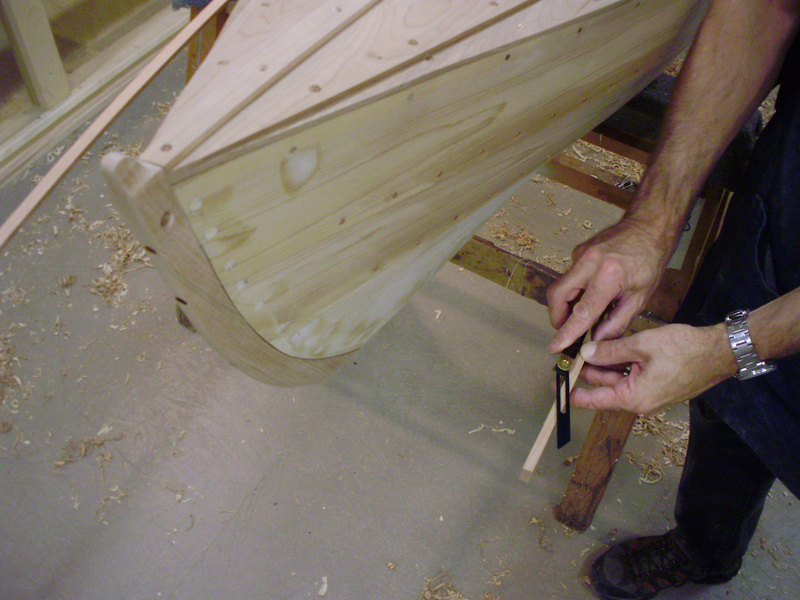 At each end of the coaming, a triangular block of cherry fastens the two ends together. 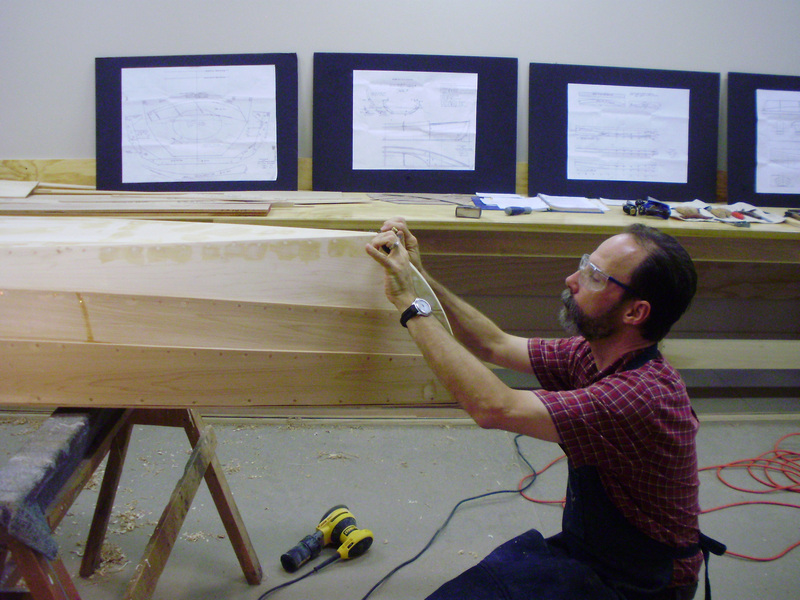 The block is fastened in place from the outside with four screws through the coaming. 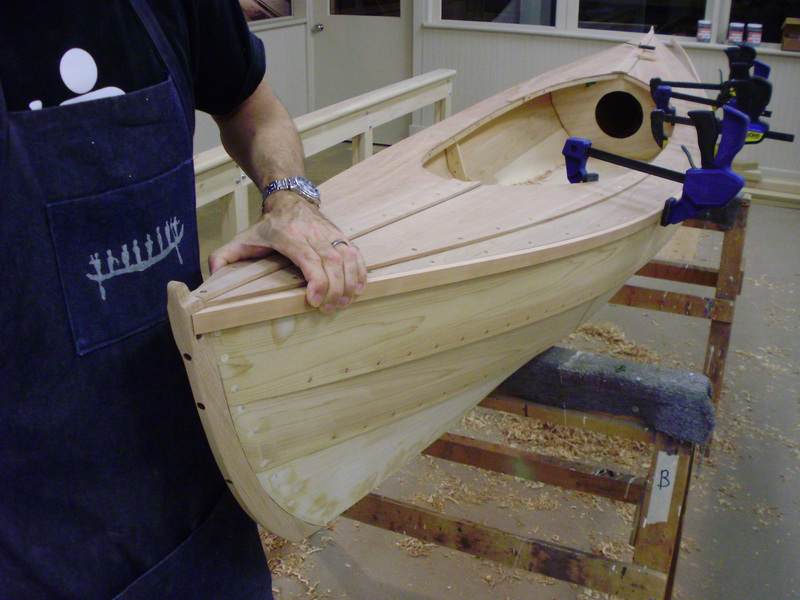 After the block is fastened, the top and bottom are faired into the coaming. 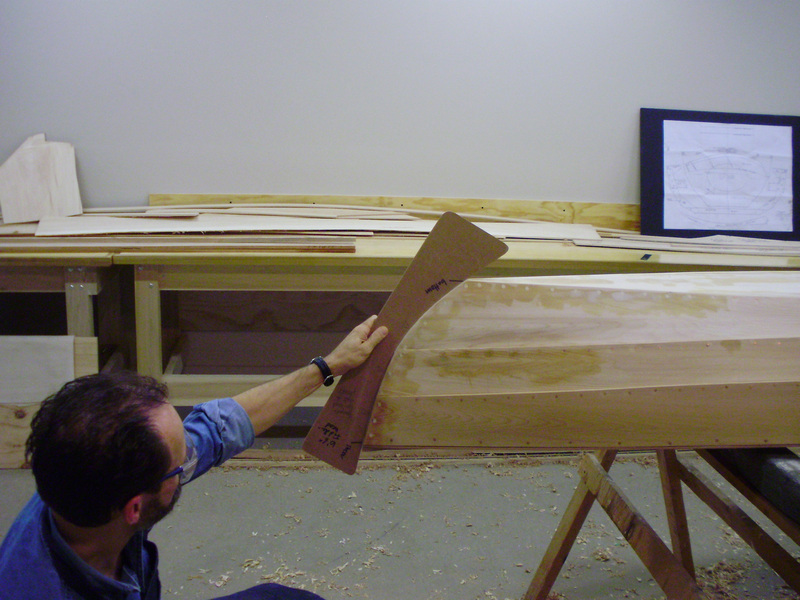 Now is a good time to stand back and look at the coaming. 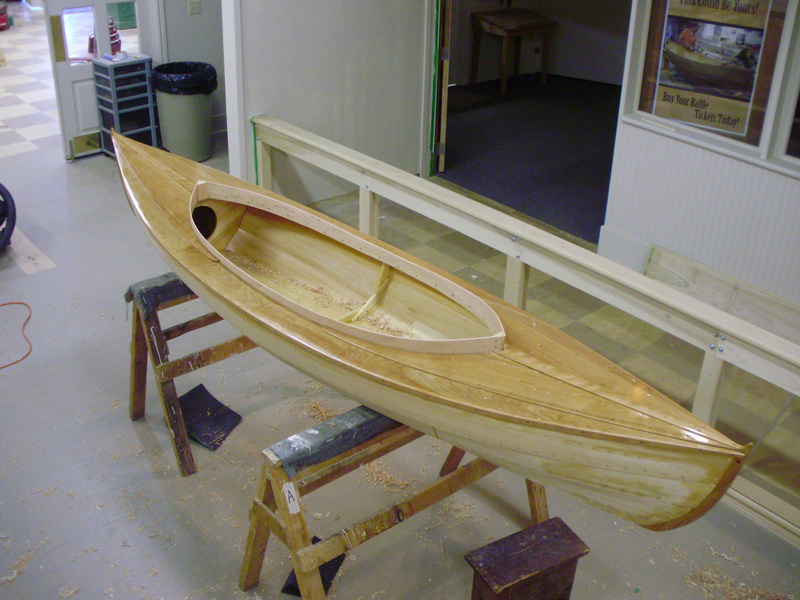 For this boat, I decided that it was a little too high in the middle, so I got out the plane and gave it some more sheer. 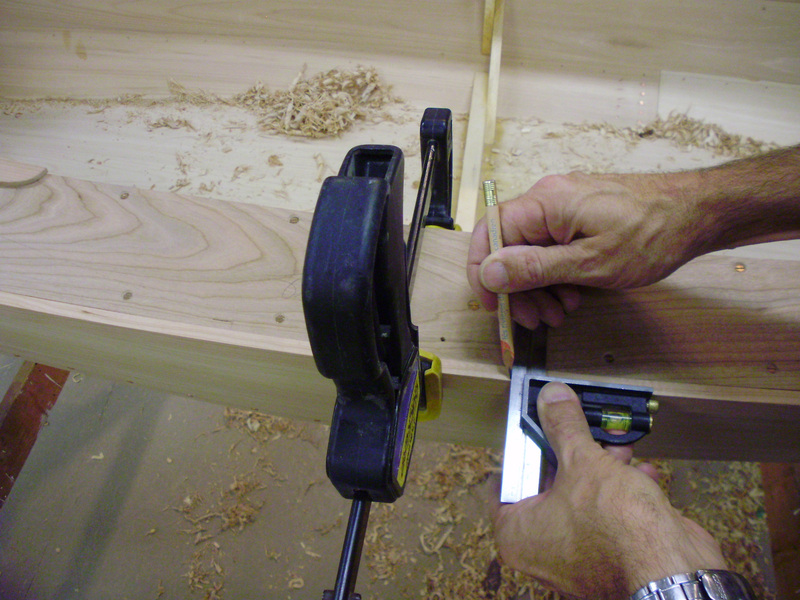 Do this carefully, and don’t forget to sight from each end as well as each side as you’re working. The designer has come up with an ingenious solution for finishing the coamings which avoids what can be a tricky raking beveled cut. 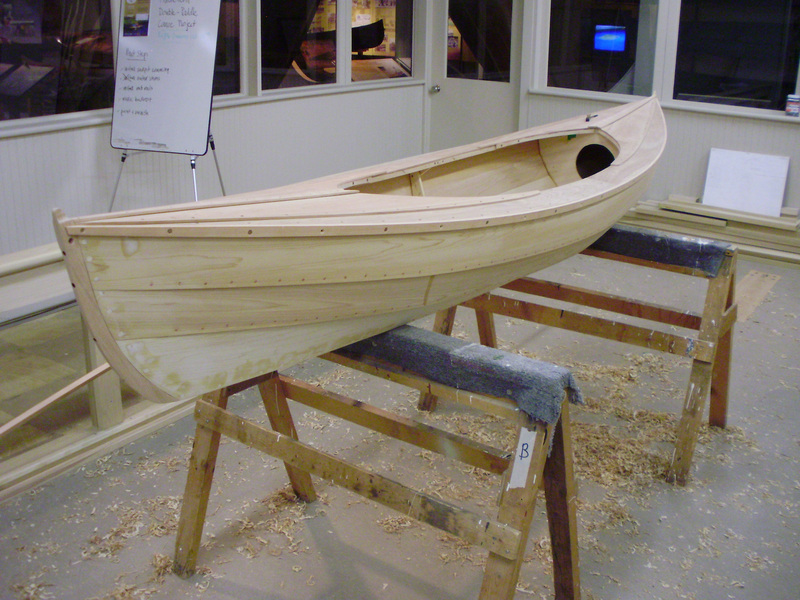 It begins by sawing off the rough ends of the coaming and the triangular block. This leaves a blunt surface at each end. 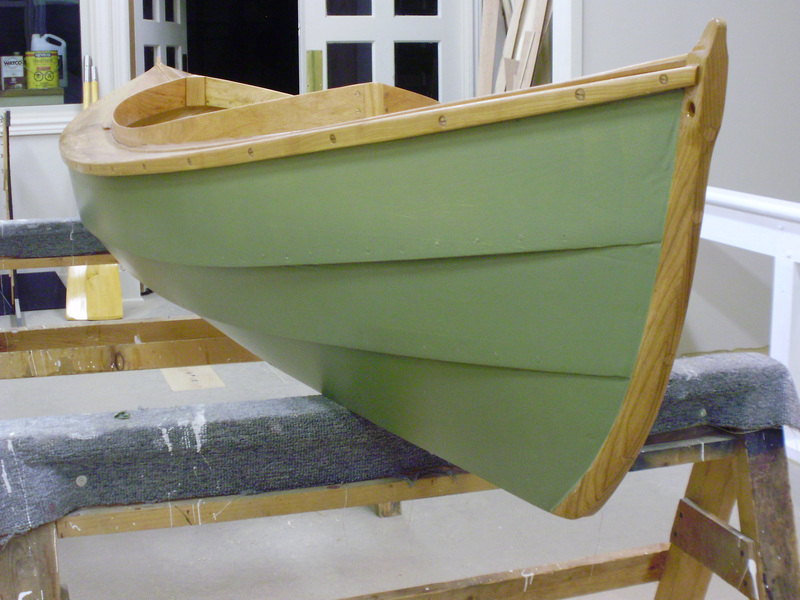 This is finished with another triangular block that sits on the deck cap. This little block ties everything together nicely. This is attached with a little thickened epoxy. And left to dry overnight. 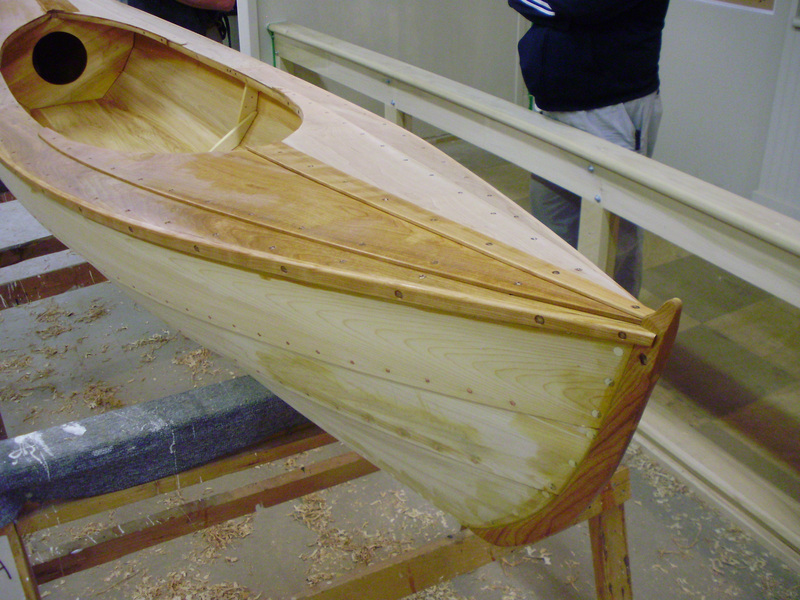 Then it’s back to sanding, fairing the coaming and blocks together into a pleasing whole with smooth transitions between the different pieces. 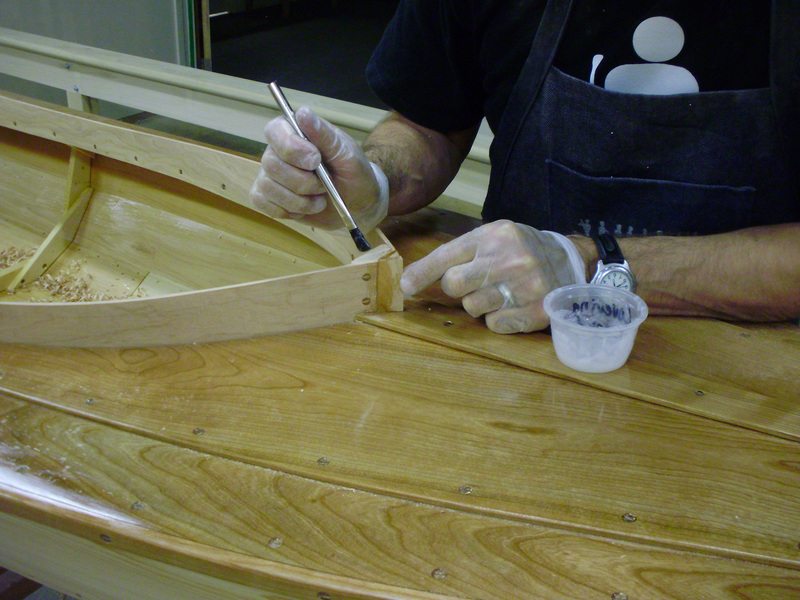 And then it’s back to varnishing, building up a good solid surface. 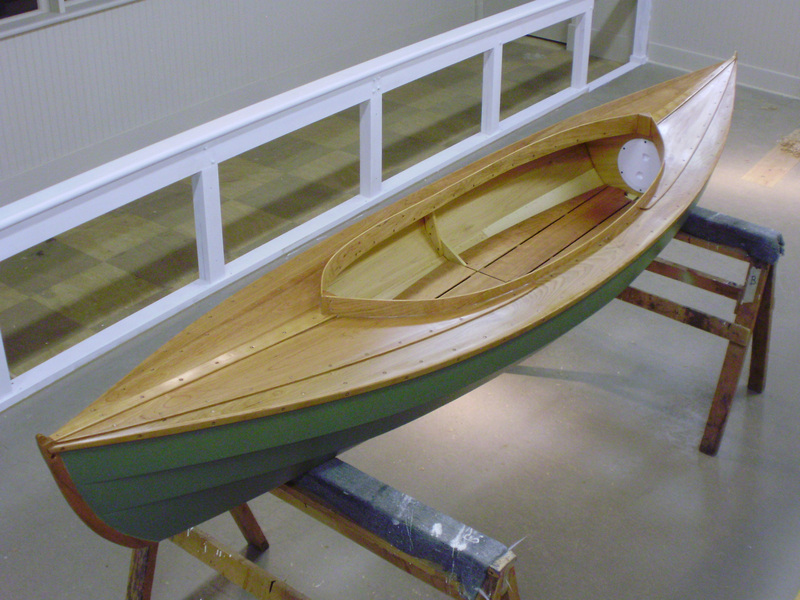 Because I was in a bit of a hurry, I used a quick-drying acrylic enamel on the exterior hull and the interior bottom. 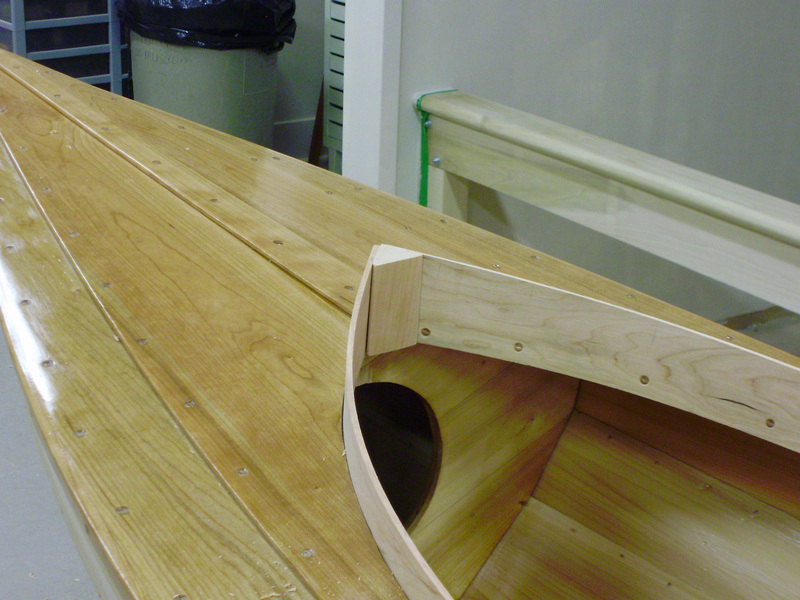 The last step was to make some nice cherry floorboards that go in in two sections. And here we are, a finished Fiddlehead. 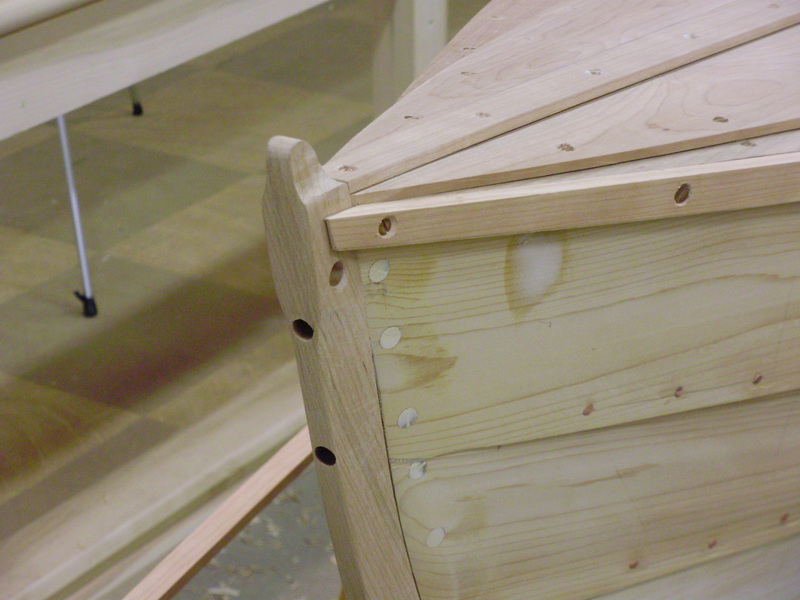 Here’s a shot from above showing how the beveled end of the outwale fits against the stem. 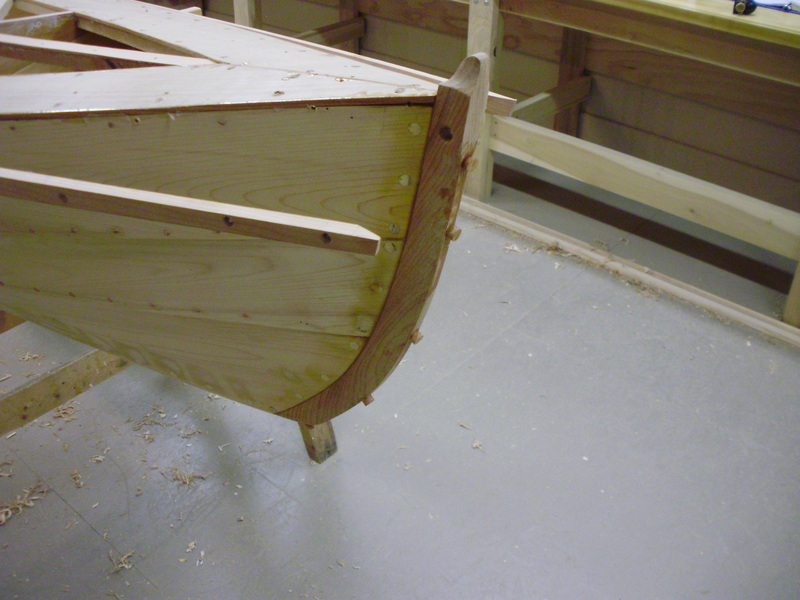 With the end of the outwale cut and beveled, the outwale is clamped amidships. 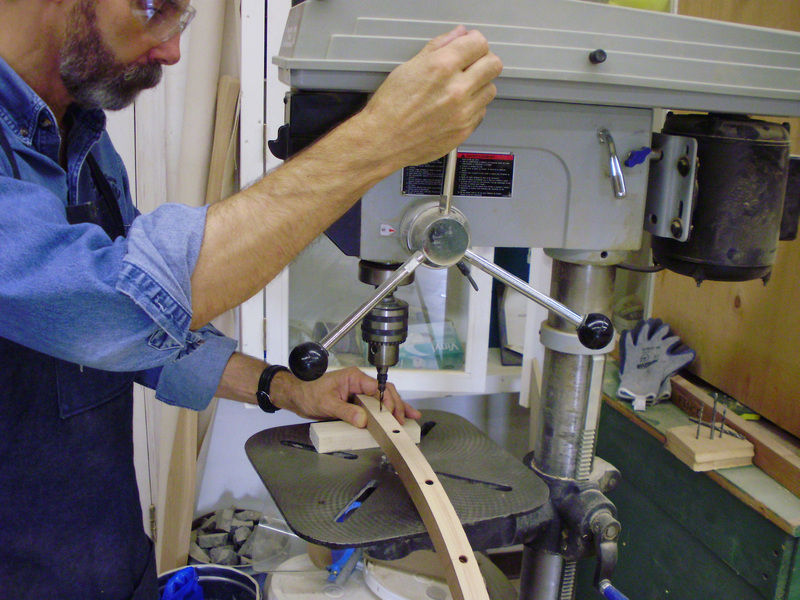 It’s important to make sure that it’s clamped so that this end fits tightly, and to make a centerline hash mark so you can find this position again, because now comes the tricky part: fitting the other end. 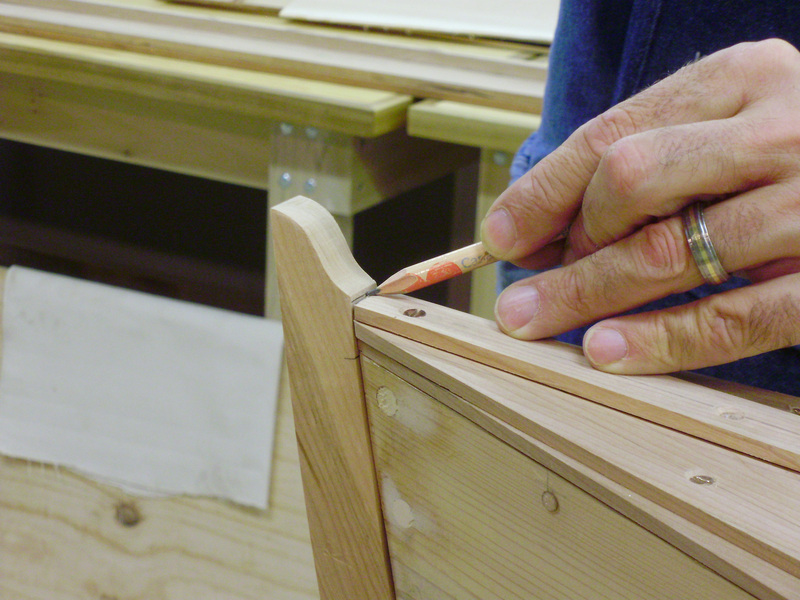 Before the bevel from the other end can be transferred to the stock,we need one other important mark. 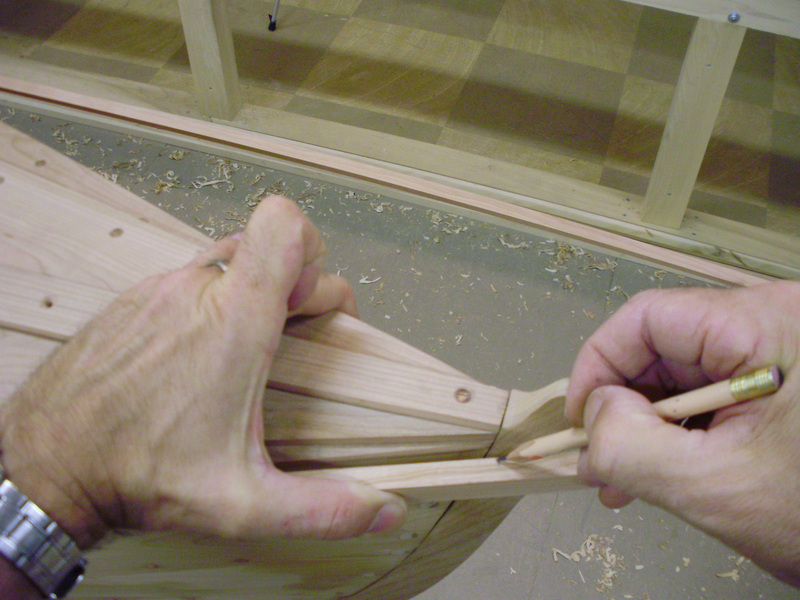 Bending the outwale in as far as it will go, transfer the intersection of the outer stem and sheer plank to the stock. 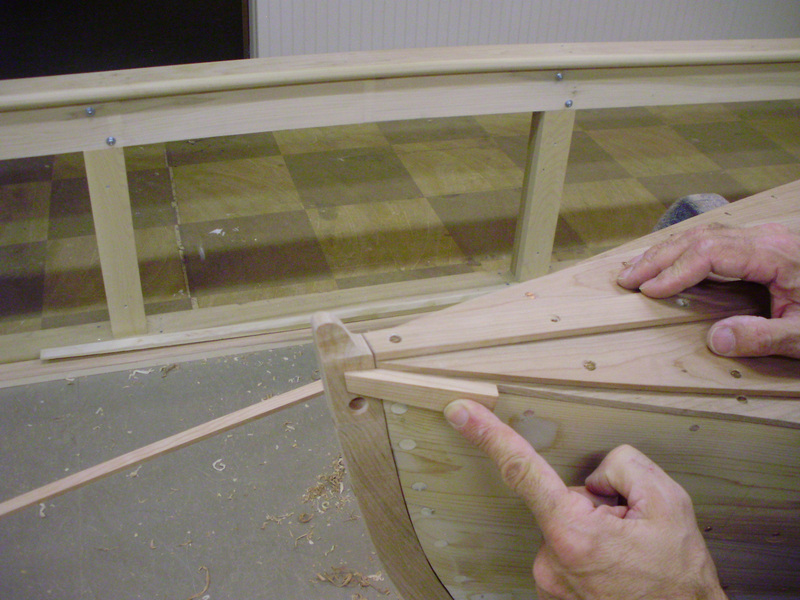 Now transfer the bevel using the mark just made as the origin point on the inboard side. Check that midships hash mark again, then cut the other end of the outwale. I usually cut it at least 1/8” too big and then gradually fit it into place. The screws that fasten the outwale on are highly visible, and it looks terrible if they’re not lined up evenly, so I clamped a block to the drill press along which the outwale slides, ensuring that the countersunk holes are in a straight line. 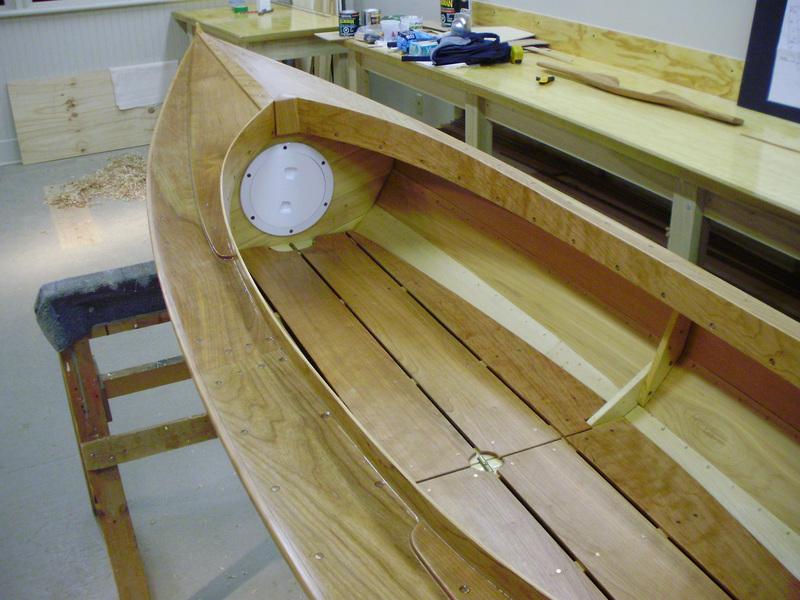 Here’s the finished outwale fastened in place. Here’s a long shot. 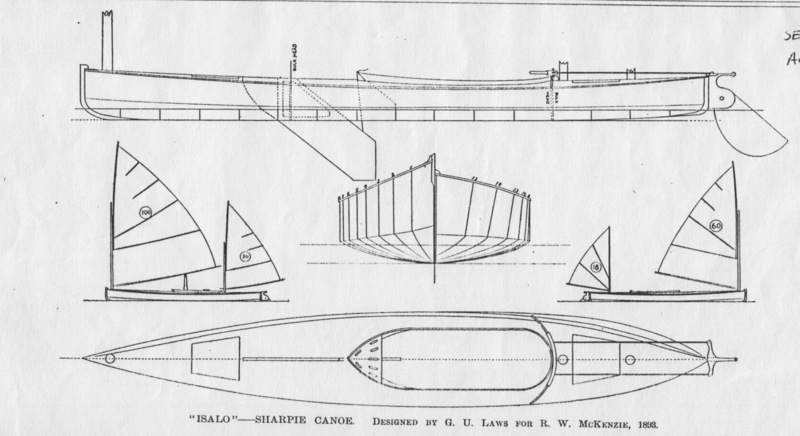 The outwale makes a dramatic improvement in the appearance of the boat because the shadows cast by it on the sheer plank really define that important curve. 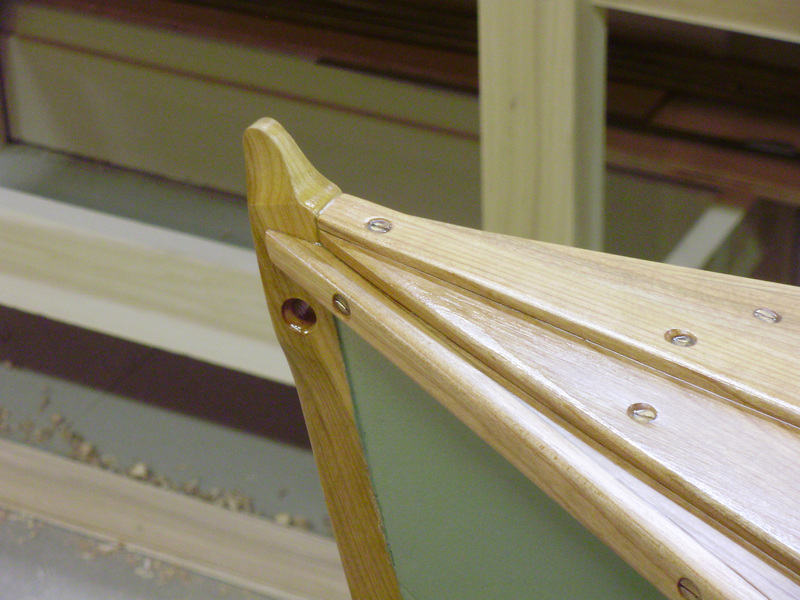 Now you can see what a nice effect the deck cap gives: the lines of the outwale, deck edge and deck cap edge all converge on our nicely-finished stemhead. 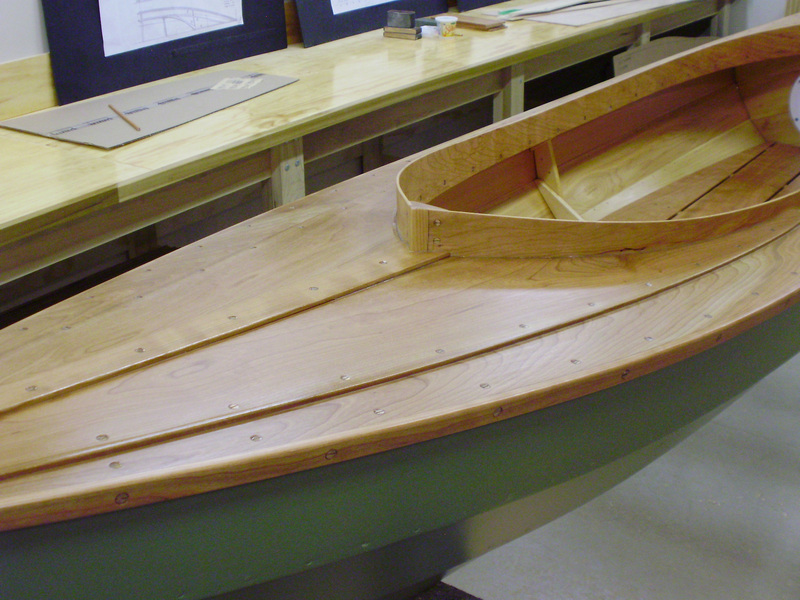 Once both outwales are fitted, the combination of curves that make up this little canoe is visible. 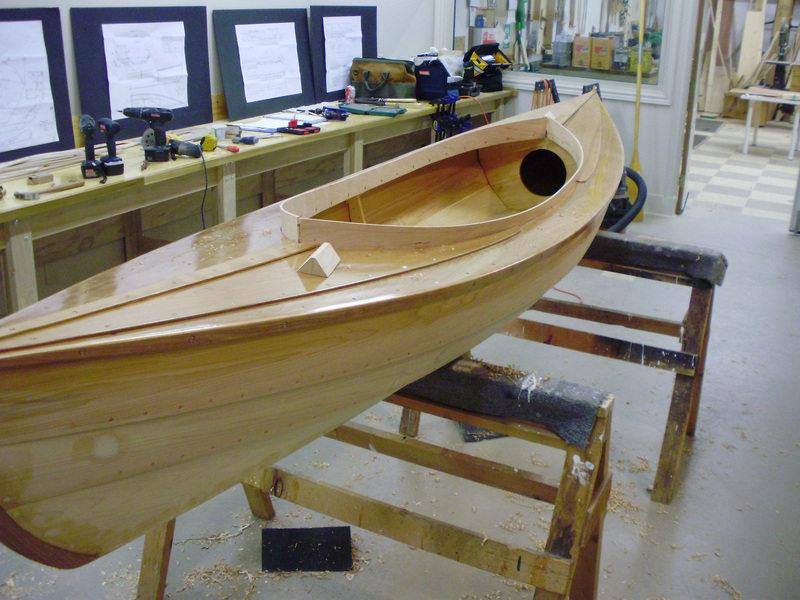 This is a stage where taking your time really matters, because these are the details people will notice on the finished boat. It took me a whole day, for instance, just to get out and fit the outwales. Now that everything has been dry fitted, it’s time to take off the decking to varnish the underside side before final assembly. 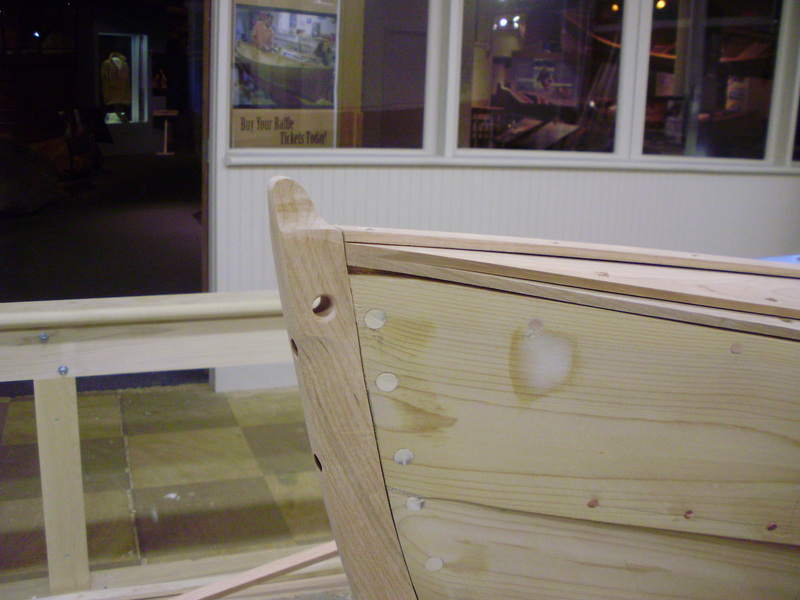 Until now, the hood ends of the planks at the stems have only been roughly trimmed, mainly to get them out of each other’s way when the planking was going on. 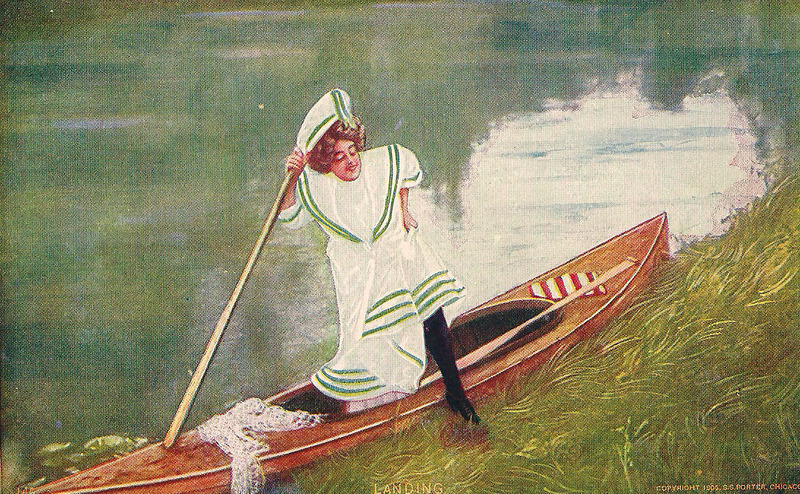 They need to be dressed down to a smooth curve and square across the end of the boat. 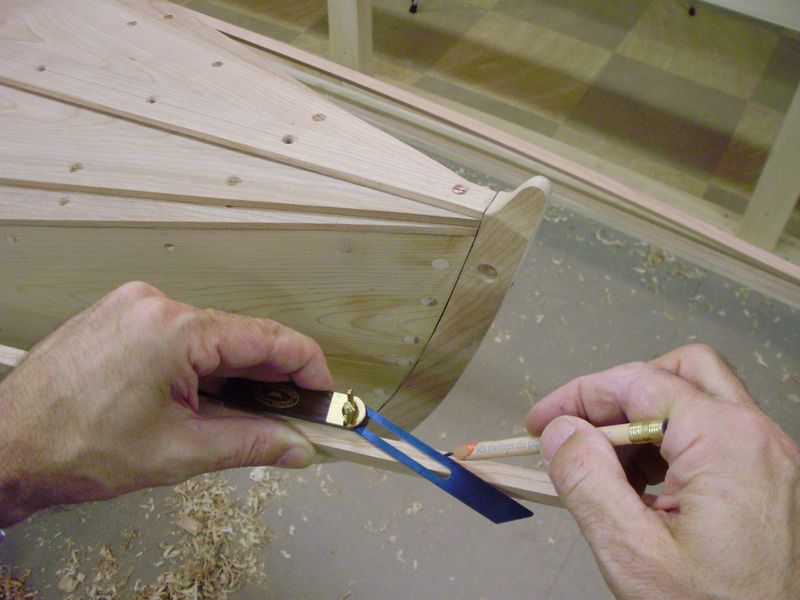 This latter part is tricky, as it’s very easy to trim them at an angle and take off too much on one side. 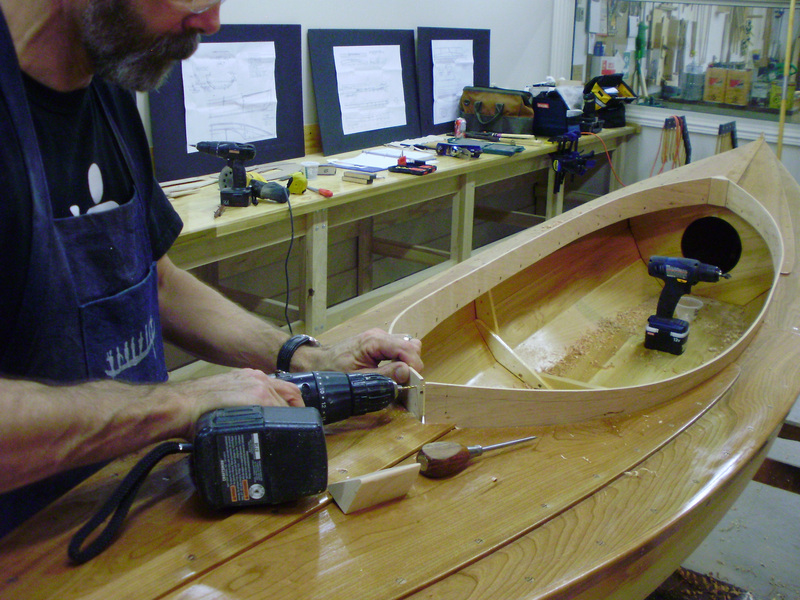 The block plane, the spokeshave and even a belt sander all have their place in this step, though it’s very easy to overdo it with the latter tool. It’s best to work slowly and take only a stroke or two before checking with the template again. 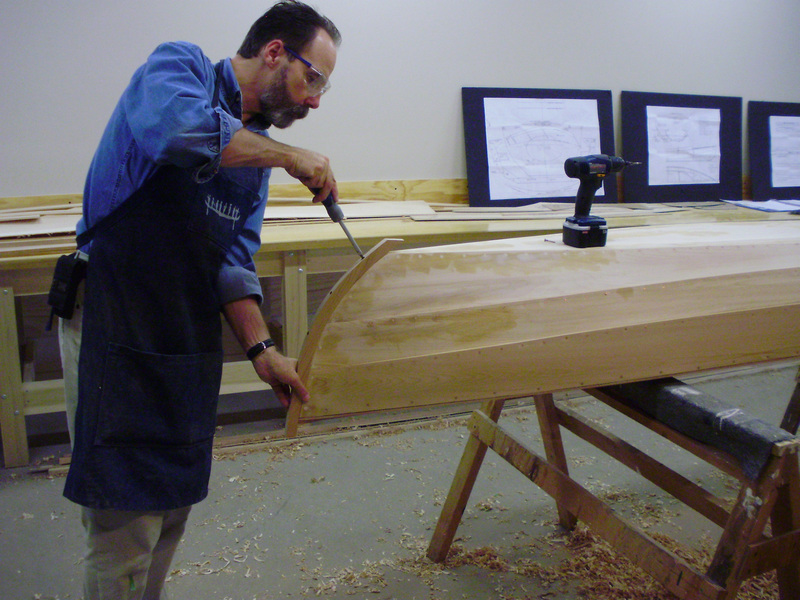 One way to test the accuracy of the curve you’re shaping, and especially whether it’s square across the boat, is to use the inside of the outer stem, which has been cut from cherry stock using the inner stem pattern from the plans as a template. 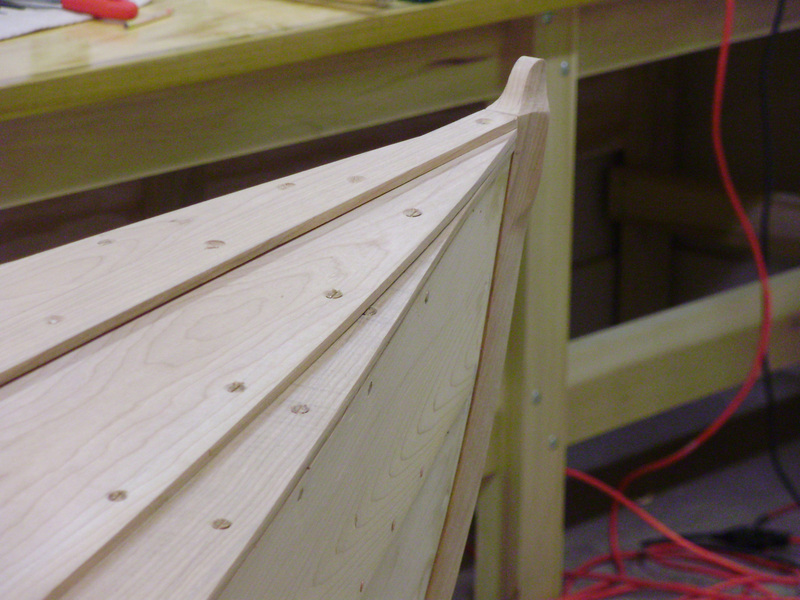 At this point, the outer stem is still rough stock, though the inside edge has been faired. 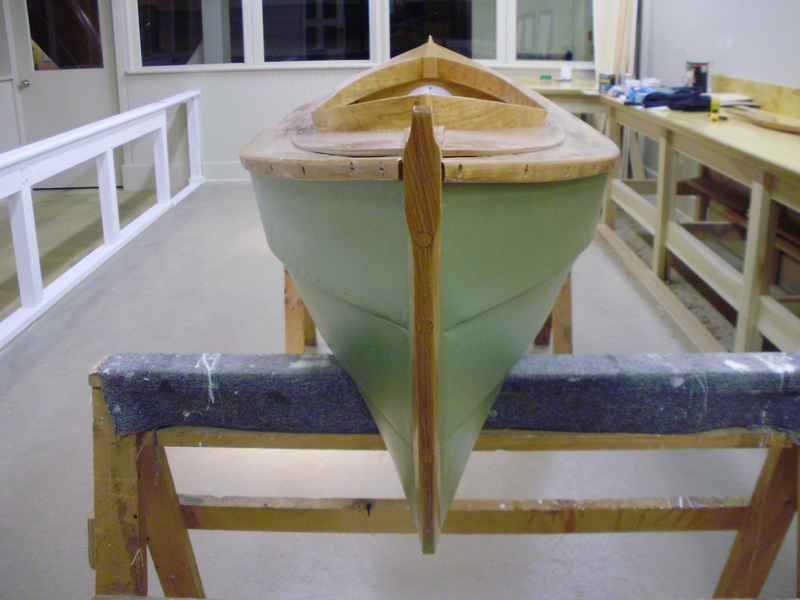 Once the curve was dressed down to a fair shape that also fits the inboard face of the outer stem, I made a template for next time which was checked against both the inboard face of the inner stem and the outboard face of the planks on the boat. After the fastening holes are marked on the outer stem and carefully checked to see that they won’t conflict with any of the hood end fastenings already on the boat (something which becomes increasingly complicated as the building process goes on and you add more fasteners) they are drilled and countersunk on the drill press to make sure they’re square. While holding the stem on the boat, I also made marks to remind myself at the drill press what angle the holes should be drilled at. Often, the planking will be a little thicker in way of the gains, so now is a good time to check the width and dress it down if necessary. The width at the forefoot has been picked up with an adjustable caliper, and when that is brought down to the sheer, it’s apparent that some wood has to come off this pair of laps. When you dress this down, you’ll also find out if you’ve countersunk the hood end screws far enough(!). The outer stems are fastened on, but only with the topmost and bottom screws, as they will be removed and put back a few more times as everything is fitted together. 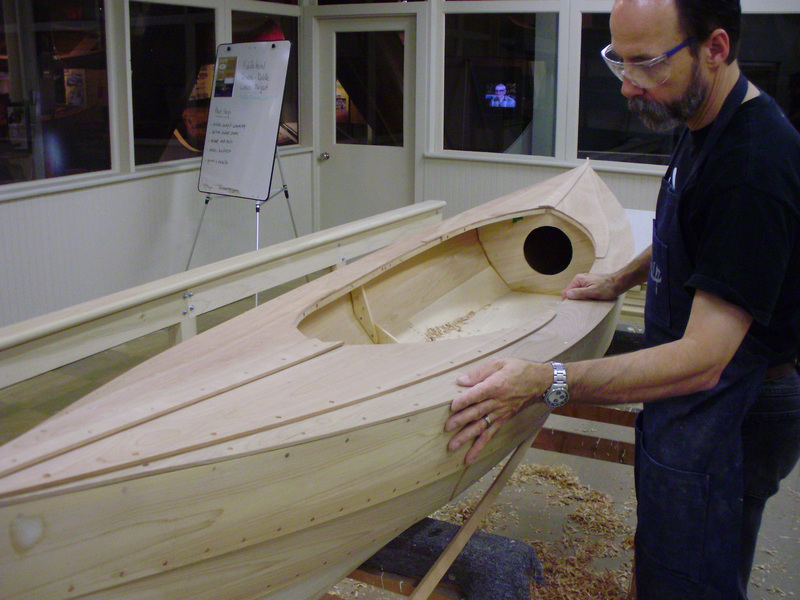 With the boat right side up, the shaping of the stem can begin. Here I’m marking the intersection of the top of the deck cap and the back of the stem curve as a reminder for when the stem top is being shaped. 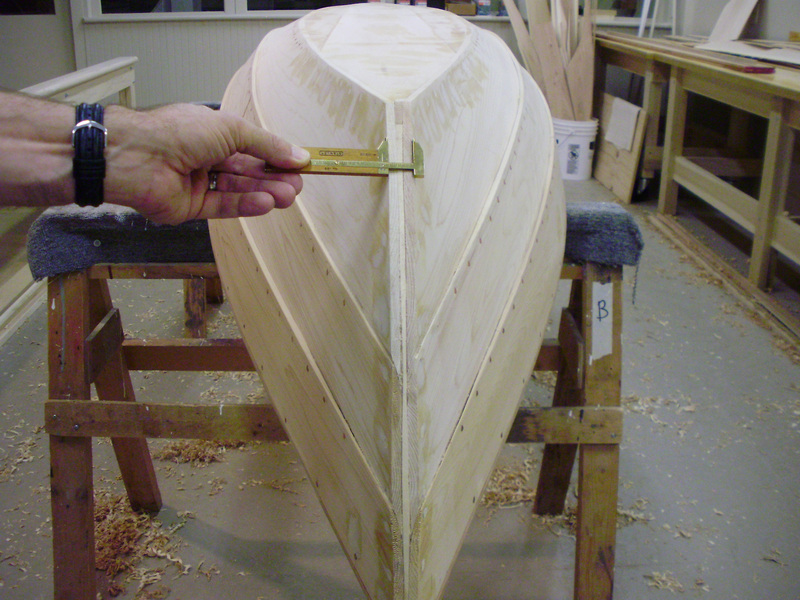 The final width of the outer face of the stem is marked to shape the tapered cutwater. As you can see from the edge of the line I’m drawing, it’s just slightly wider than the countersink holes, which will be filled with glued plugs a little later. This is why it’s important to get those screw holes in a straight line. 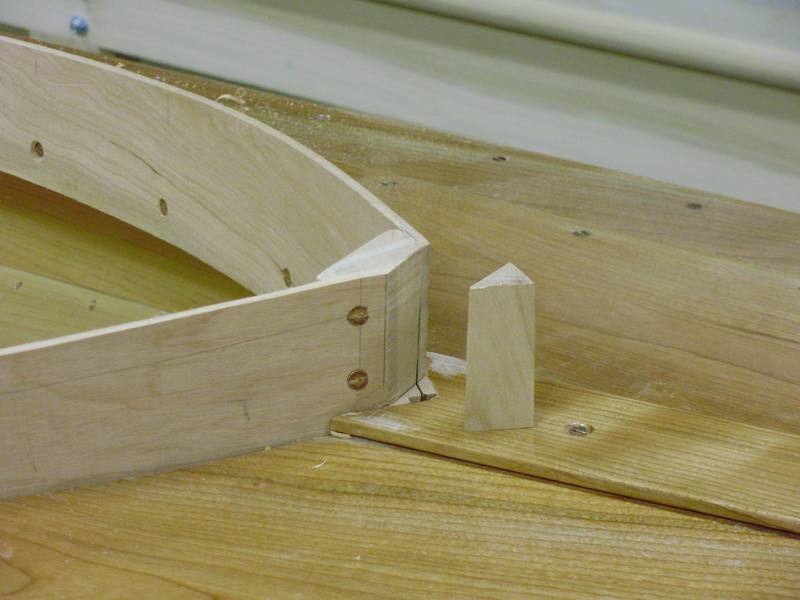 The stemhead was roughly cut on the bandsaw. 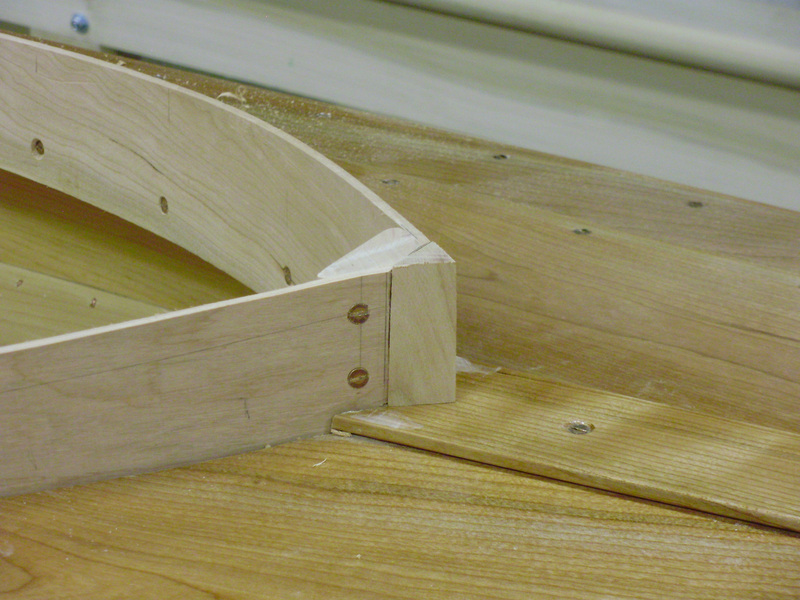 Now we need a nice radius for the top, and the handle of a foamie looks to be just the right radius to continue the curve I’ve already cut. 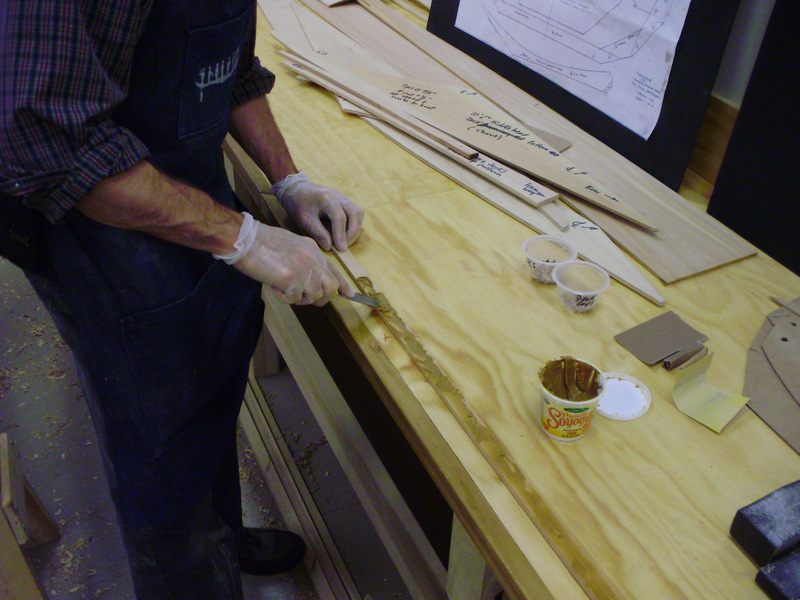 The radius marked for final dressing, along with a line that continues the sheer. 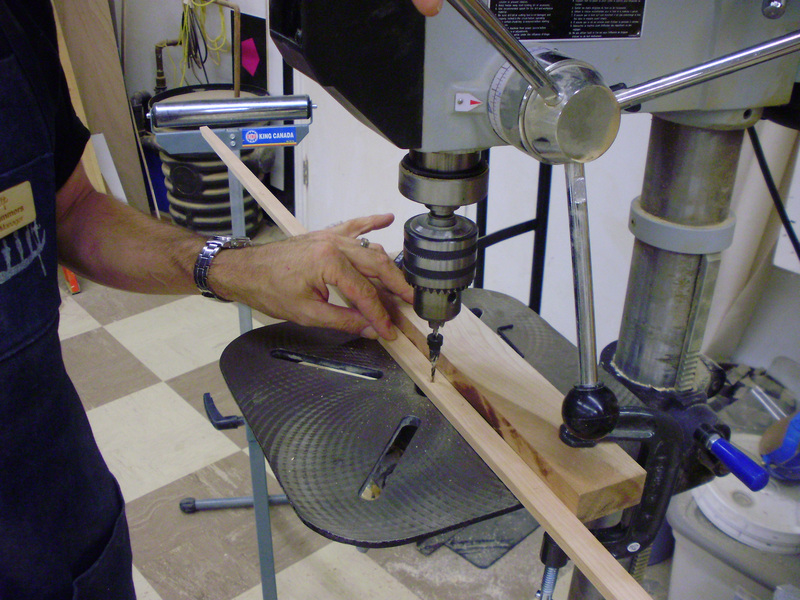 The final shape of the stemhead has been made on a belt/disk sander. 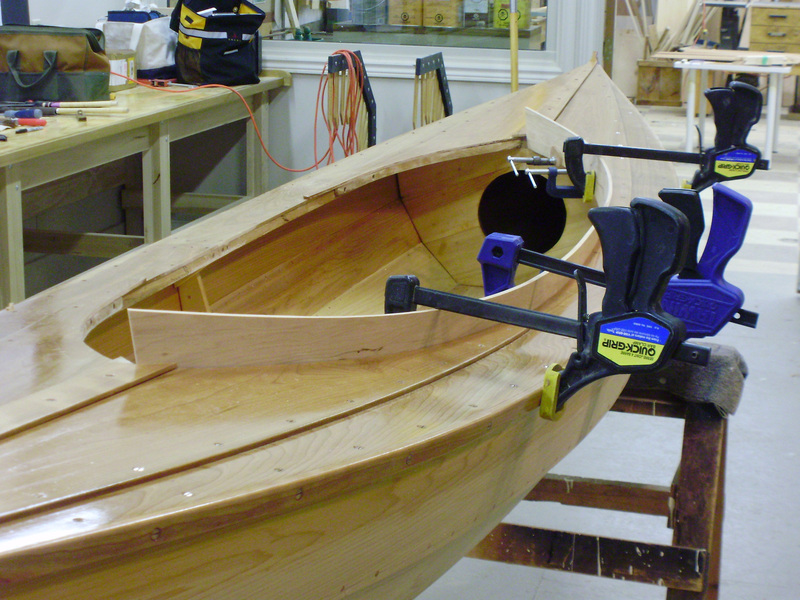 This is a powerful tool with which it’s easy to take off too much wood. 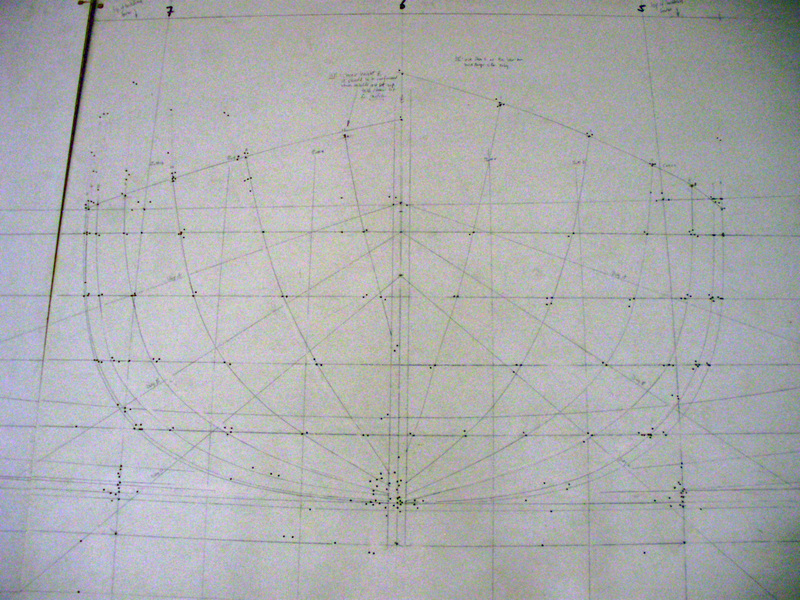 In this case, you can see that I’ve not completely followed my own line, and so the bottom of the convex part droops down instead of following the sheer—oh well, that’s the kind of detail that gets better with practice. The next step is to fair the covering boards to the sheer planks. I’ve made three flat sanding blocks by tacking cut-up sanding belts onto pieces of oak. 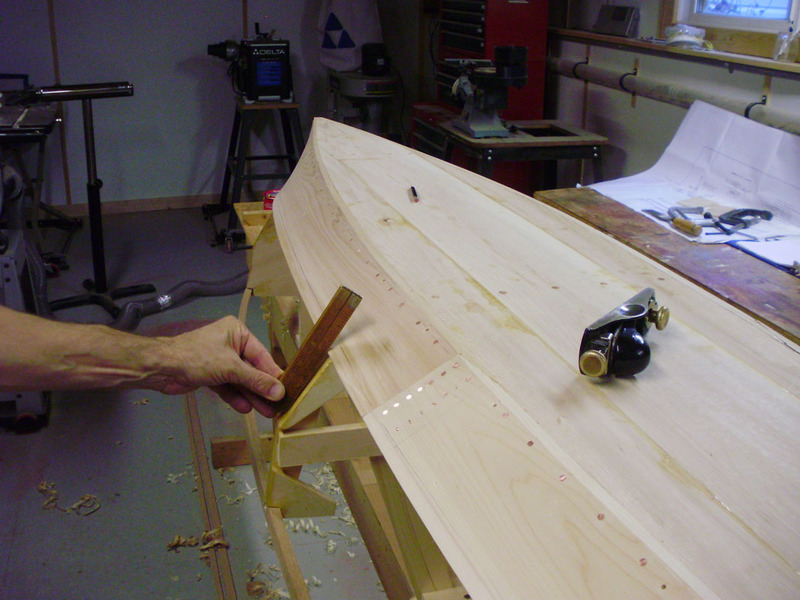 This is one area where you must back up the sandpaper with a hard block, as you’re aiming to fair everything together with a smooth curve based on the plan view of the sheer plank. 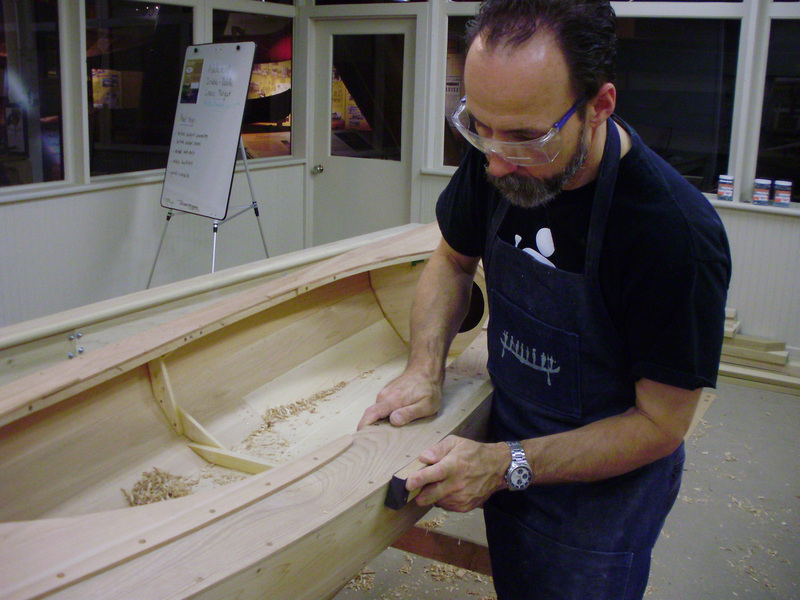 Because the cherry is harder that the cedar, I’m pressing a little harder on the upper edge of the block and using long, sweeping, overlapping strokes as I move down the boat. 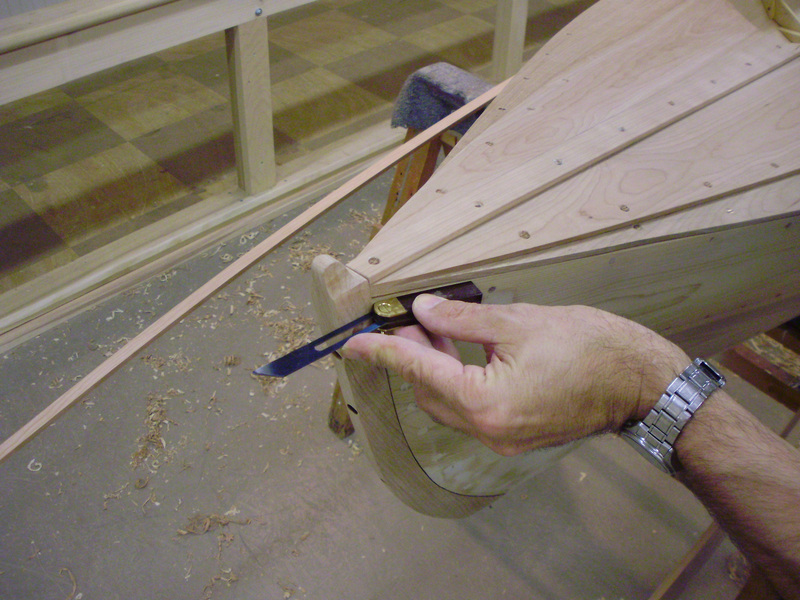 You could use a plane, but caution is required as the ringnails that fasten the sheer plank to the sheer clamp are not far below the edge of the sheer, and they’ll take a big nick out of your nice sharp plane blade if you hit one. As always, it’s important to periodically stop and sight along the work to make sure it’s fair. In this case, running your hand along it can often tell you as much by feel as by eye. 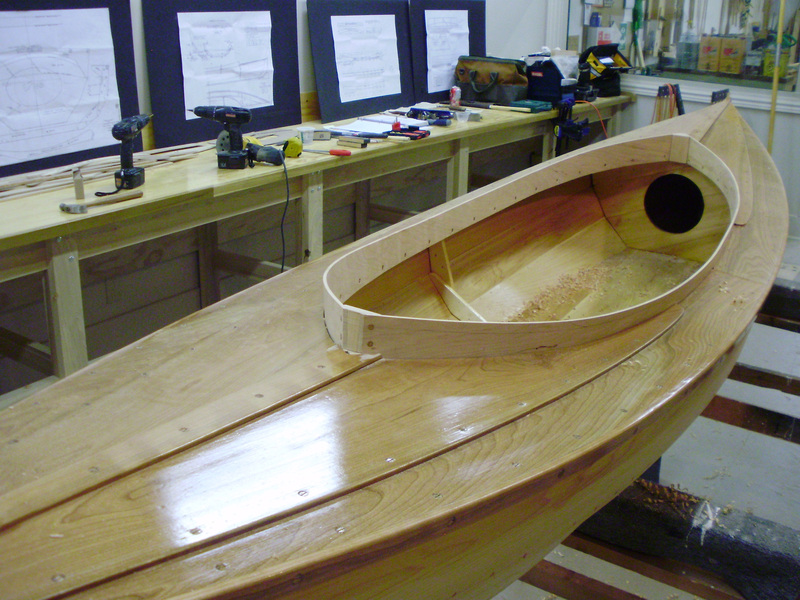 With the sheerline faired, we have a nice even surface on which to mount the outwales, as I would call them, or the “guards,” as the designer prefers. 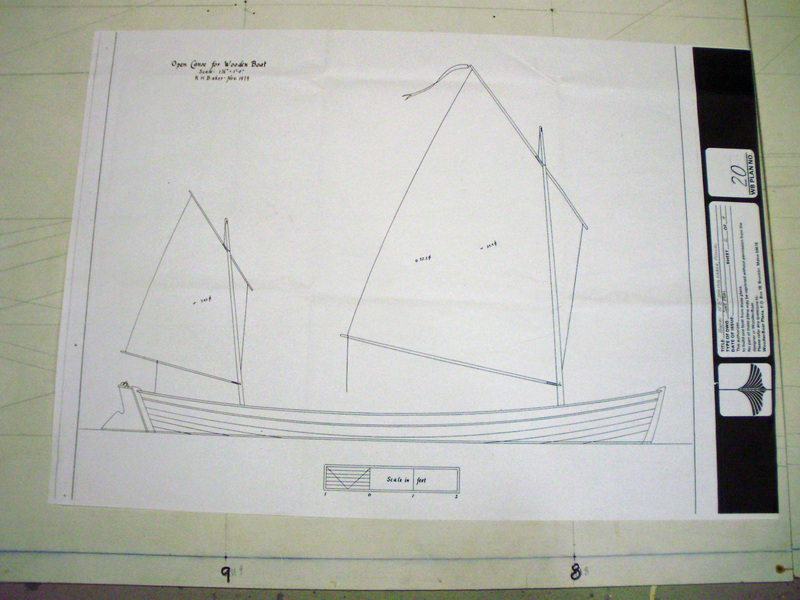 When I made the cutwater on the outside stem, I left a square portion just below the sheerline. 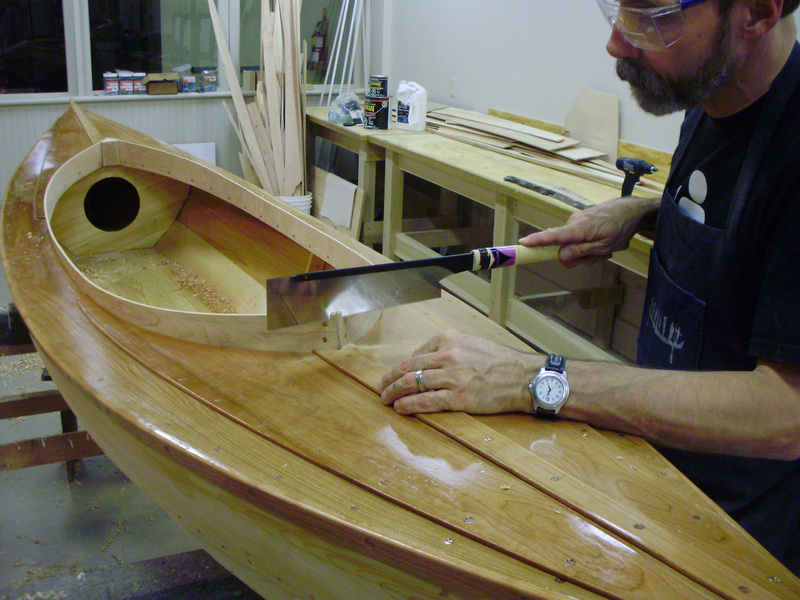 This provided a place to drill a hole for the painter, and it will also let me land the ends of the outwales and make a nice clean finish that ties the outer stem and planking together. 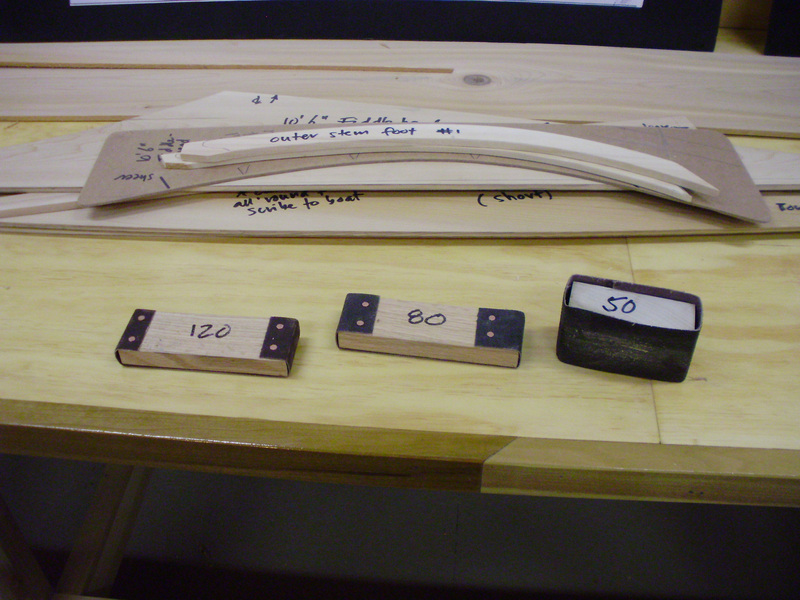 The first step is to get a small bevel gauge. 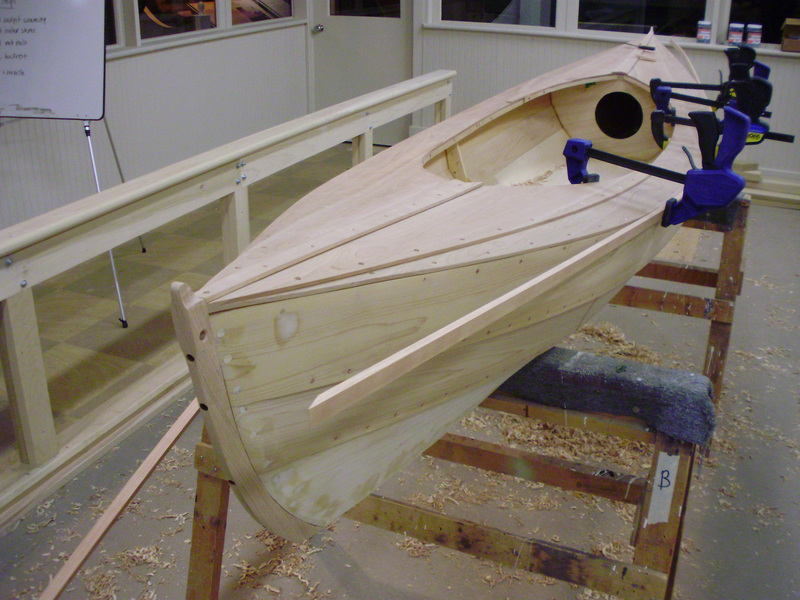 This is fitted right into the intersection of the outer stem and sheer plank to pick up the angle. 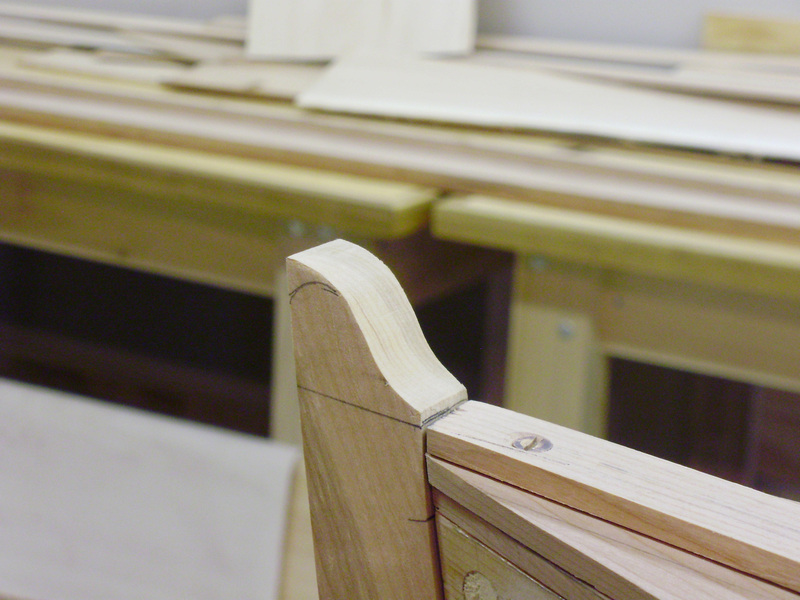 That bevel is then transferred to the end of the outwale stock. I’ve made a little mockup piece of outwale to test the angle on the end. It’s a nice touch to put a little upward taper in the end of a piece like this to lighten it up visually. In this case, that’s also a good idea because when I was drilling the painter hole I wasn’t really thinking of the outwale, and so if I don’t taper the end upward, it will awkwardly clip the top of the hole.